Yay! 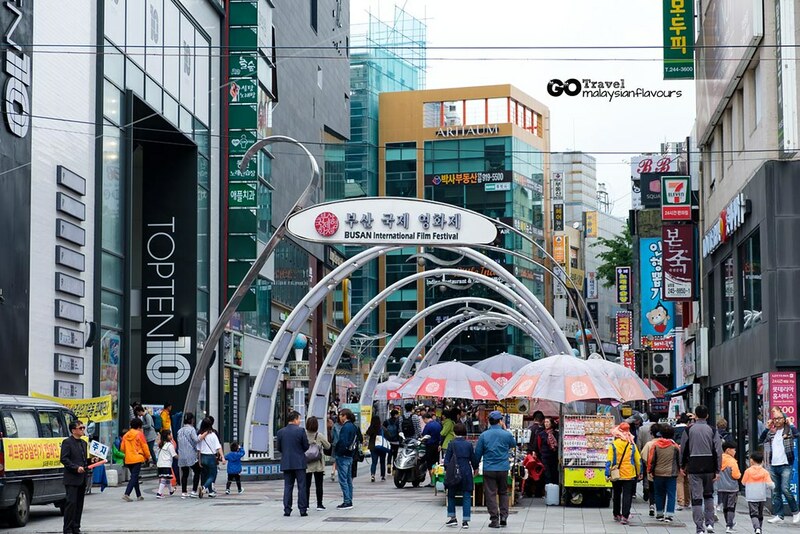 Back to Korea in May 2018 for early Summer trip 2018! 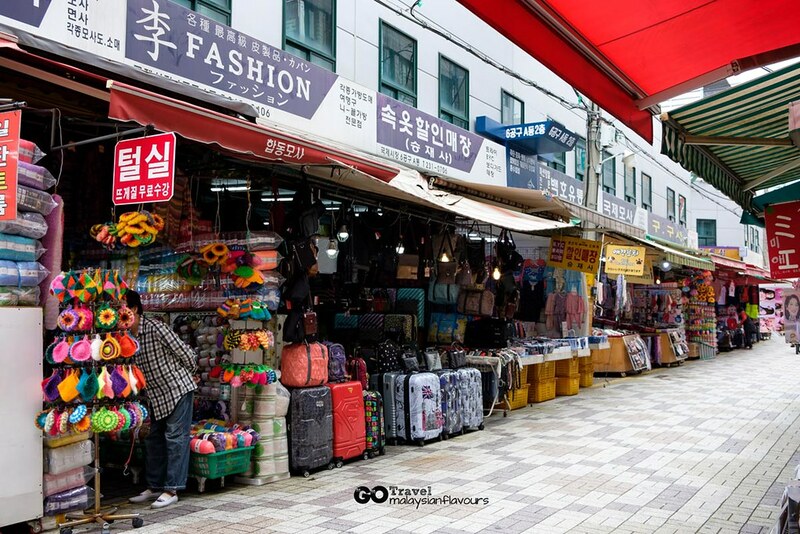 This time beyond Seoul, to the Southeastern of Korea! 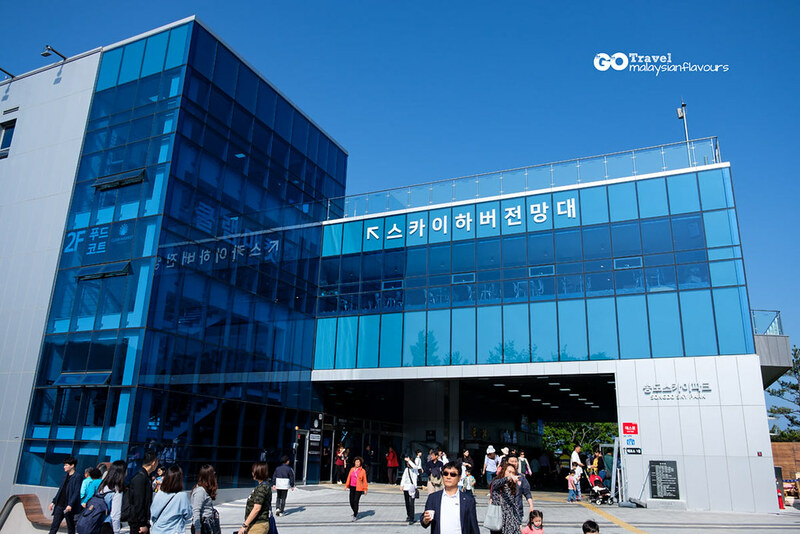 We touched down at Gimhae International Airport after 7 hours of flight, took airport limousine Gimhae Airport- Busan Station line to Busan Metropolis City and began our 6D5N trip, covering Busan, Ulsan and Gyeongnam. 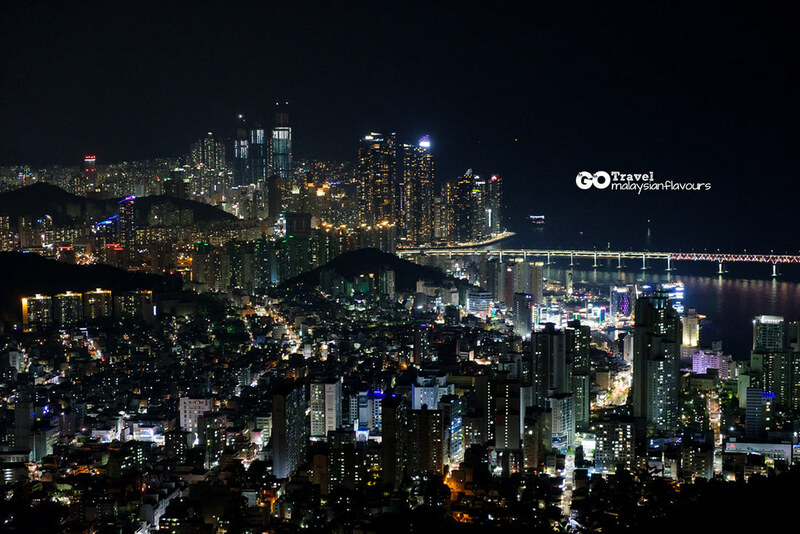 Started with Busan, the second largest city in South Korea that doesn’t need further introduction. 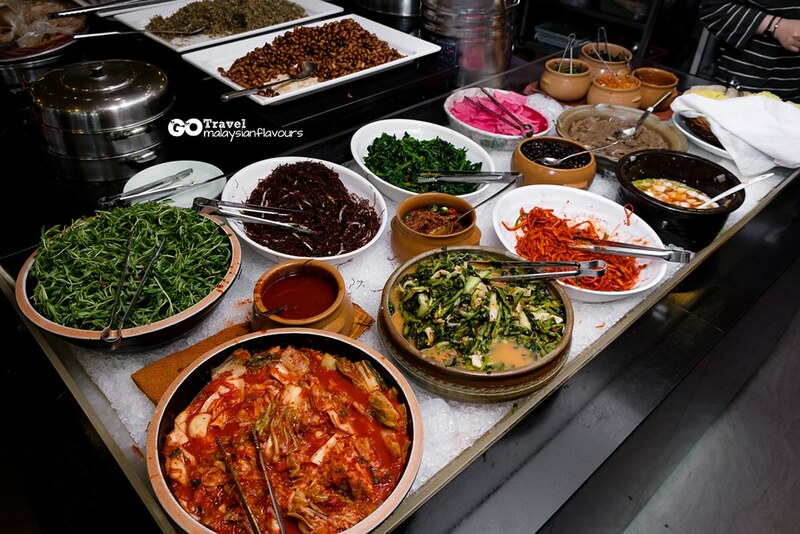 This coastal area, which is a famous tourist destination after Seoul, is very much associated with deep blue sea, fresh seafood, charming camellia, cultural art, historical temple by the sea and modern shopping district. 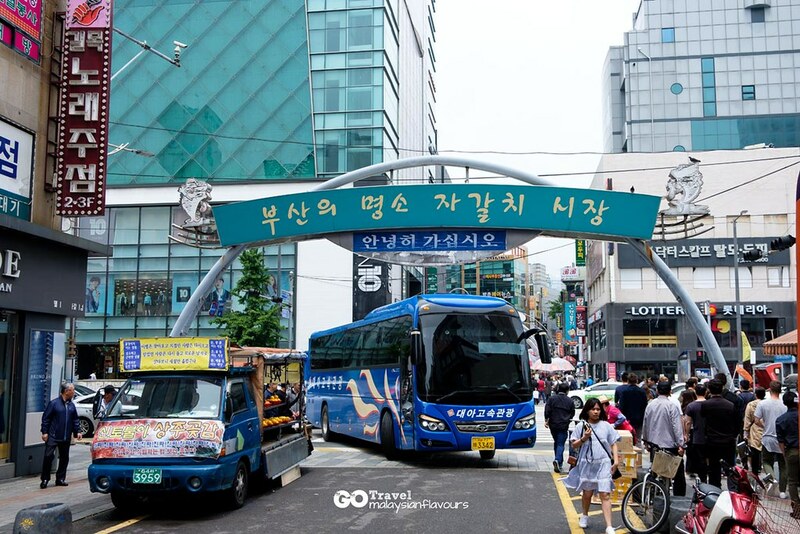 Travelling in Busan city is very easy with Busan Metro Subway that covers a lot of attractions along the Metro Line 1,2, 3 and 4. 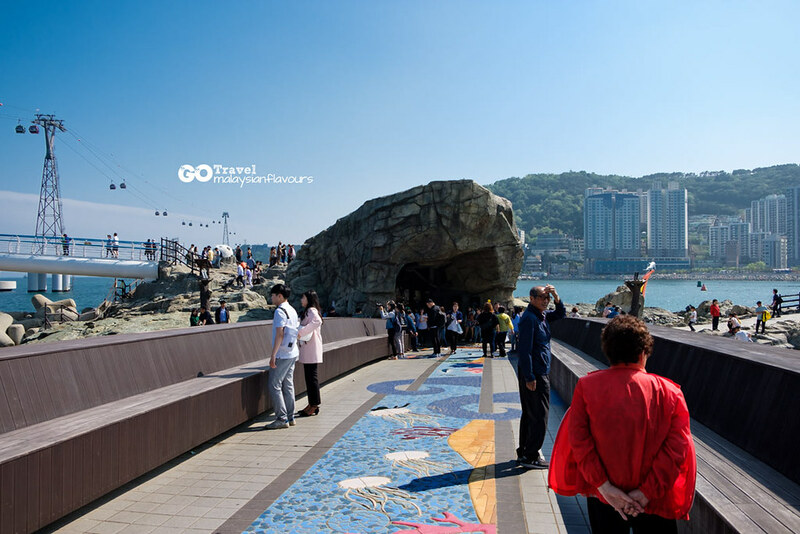 Tourists spots and beaches which are on outskirts area are mostly reachable by KTX Train and connecting buses too. Just do some homework on bus route and timetable, you are good to go. Let’s start! 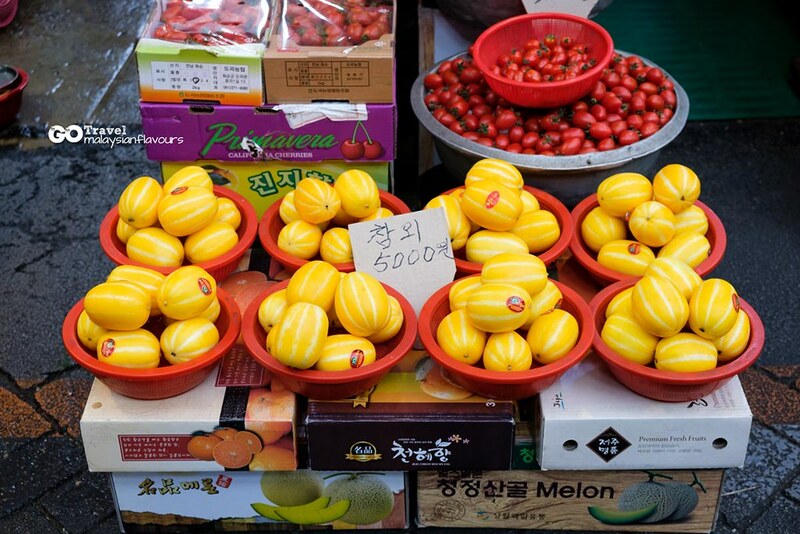 Our first stop was Gukje Market 남포동 국제시장, Busan largest traditional market that is also known as Nampodong International Market. 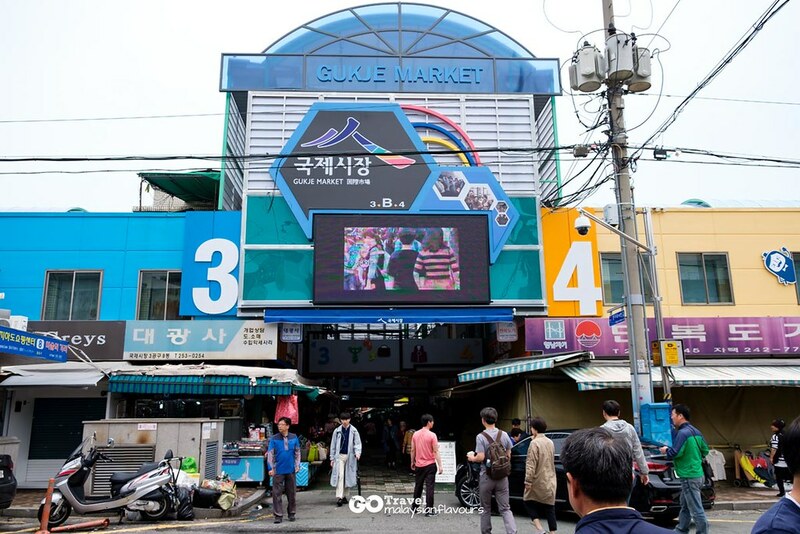 The reason why Gukje Market is named “International Market”, is because after the Korean war, refugees fled to Busan opened their business here, making it a market where you can get almost everything. 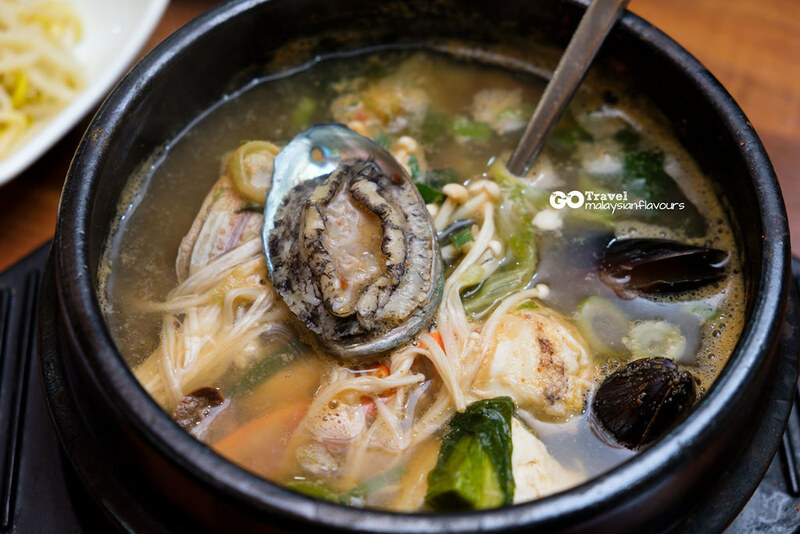 “Gukje” also means “International” in Korean. 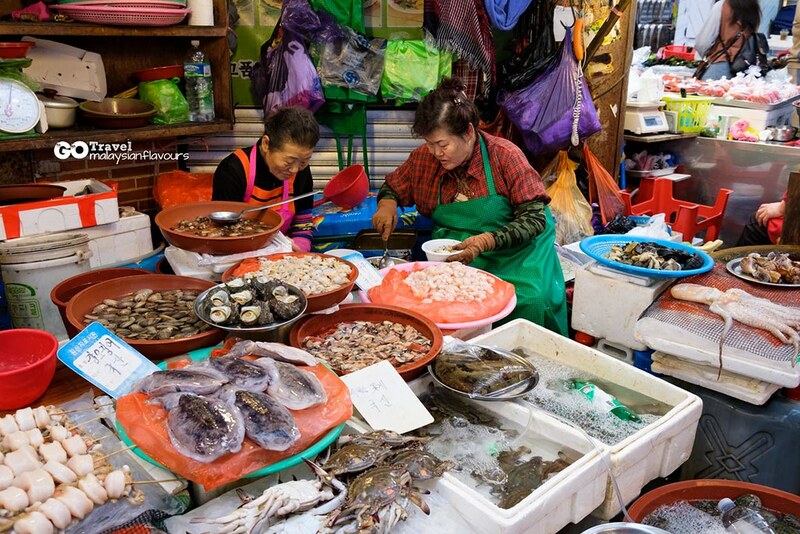 From fresh produce to sauces, seafood, souvenirs, second hand items, accessories, hand-crafted products, cooked food, we bumped into many interesting things here, both expected and unexpected. 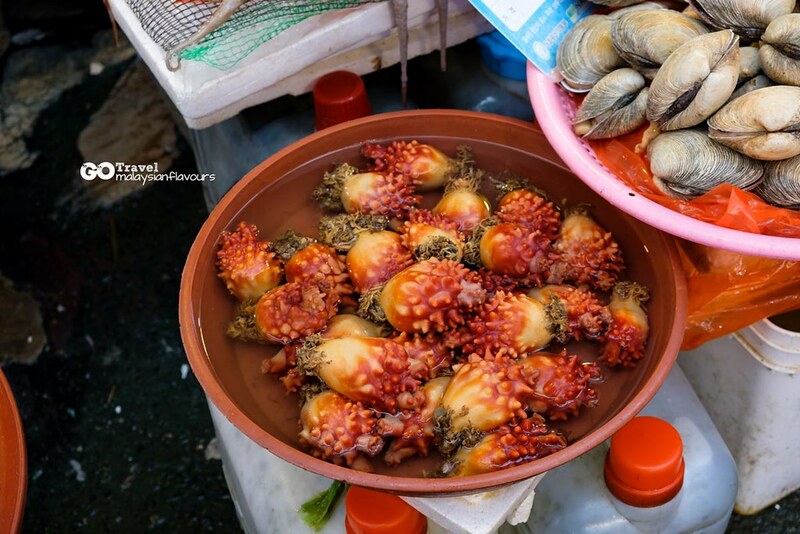 Errr… anyone know what seafood is this? We walked one alley after another, checking out what each stall has to offer. Can almost spend a half day here. 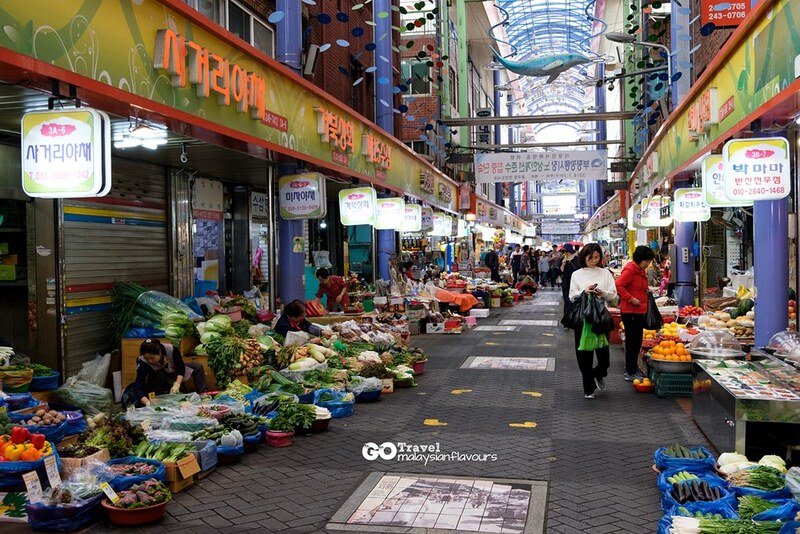 The market is roughly divided into several subsections, including Food Street, Youth Steet, Arirang Street, Vintage Street. 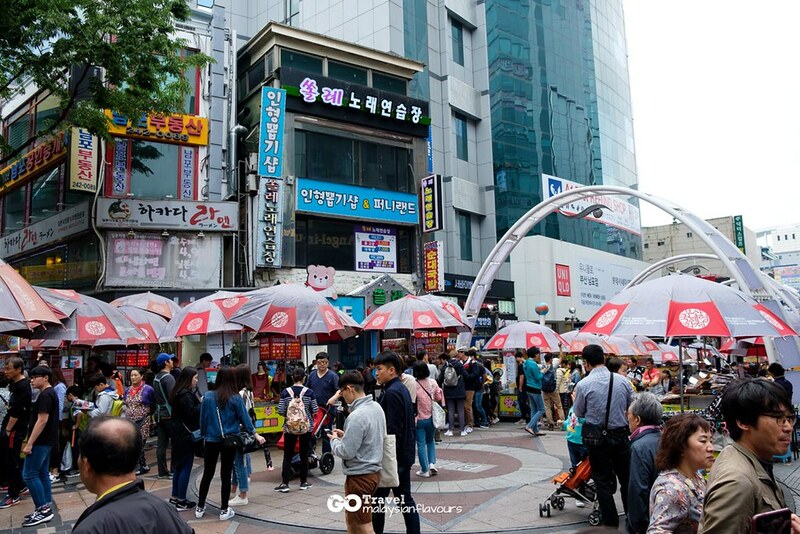 Bupyeong Gangtong Night Market, Street of All Things, Changseondong Food Alley are closely connected to Gukje Market too. 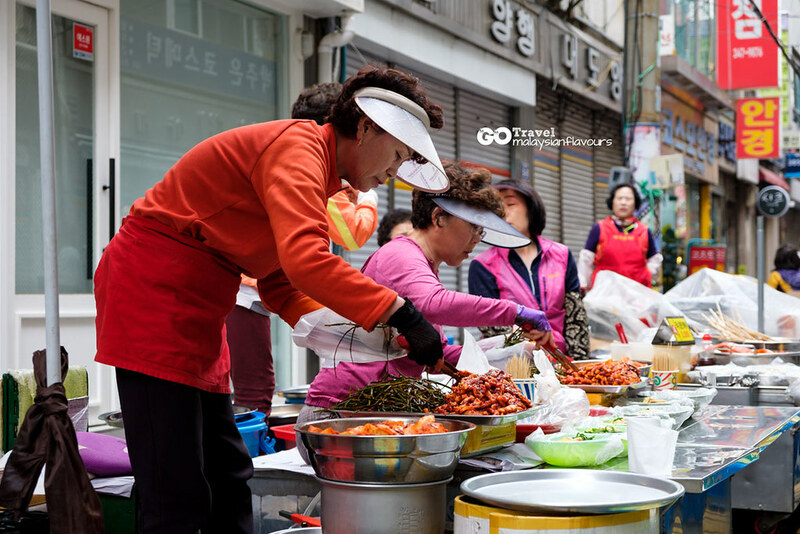 Street full of snacks. 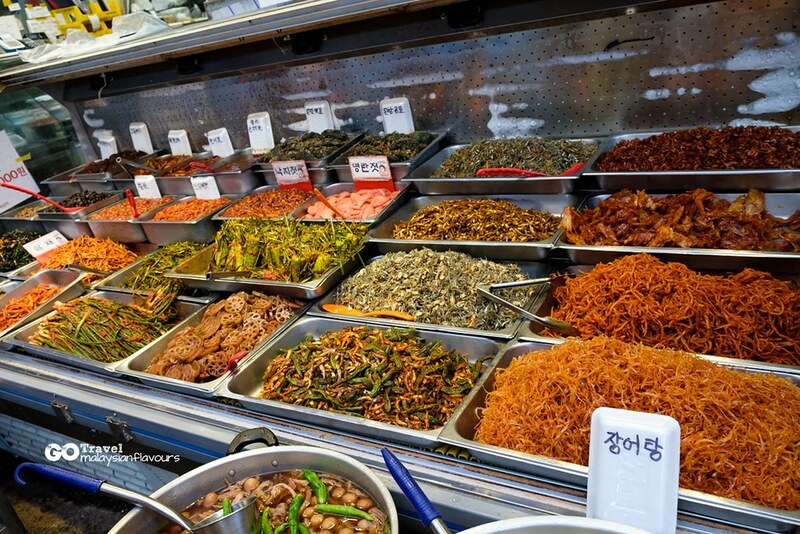 Among the popular street food here are bibimdangmyeon (spicy glass noodles), ssiathotteok (seed and sugar filled traditional pancake) and yubujeongol (fried bean curd hot pot). 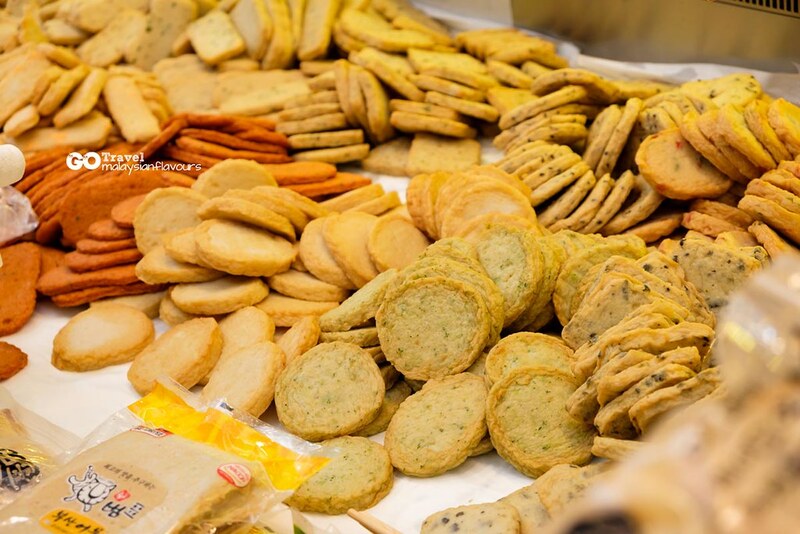 Some stalls provide mini stools for you to sit down and enjoy your favourites. 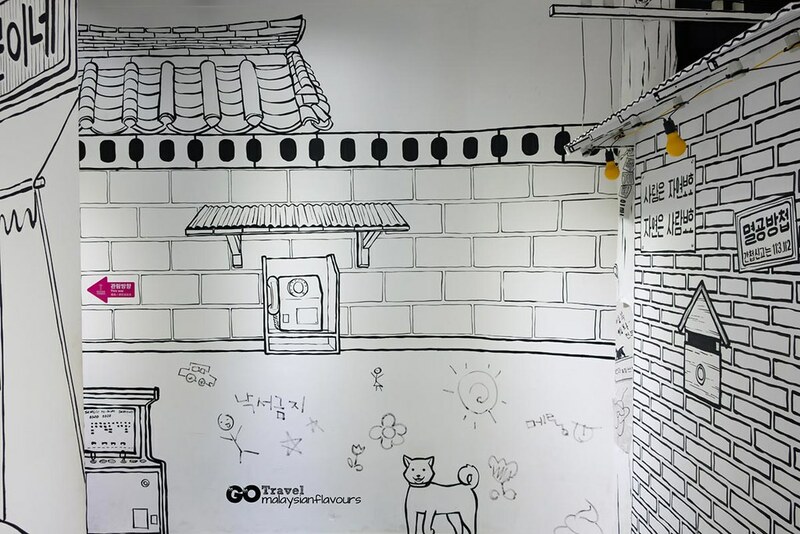 If you have more time, visit 609 Cheongnyeon Mall, a global cultural space run by young, up-and-coming merchant. It features lots of artistic, hand-crafted and creative work. It is located at Building B in Zone 6. 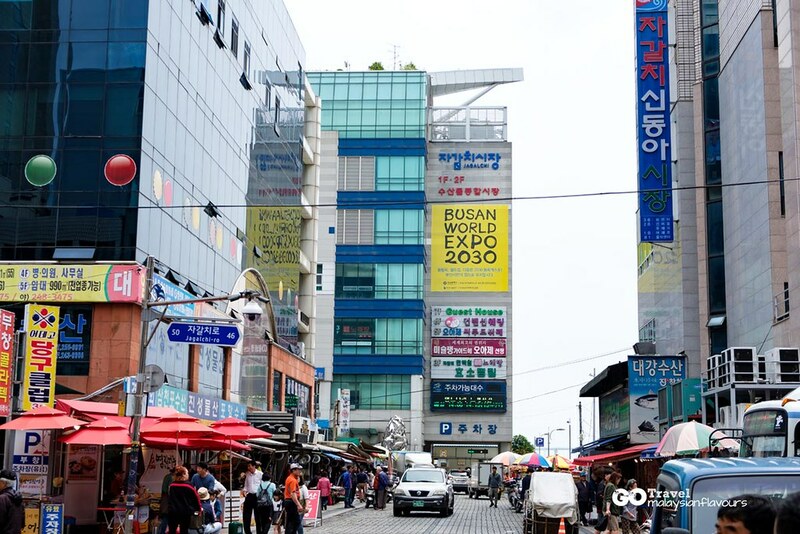 Address: (Changseon-dong), area 25, Gukjesijang 1-gil, 2-gil, Jung-gu, Busan, Korea. 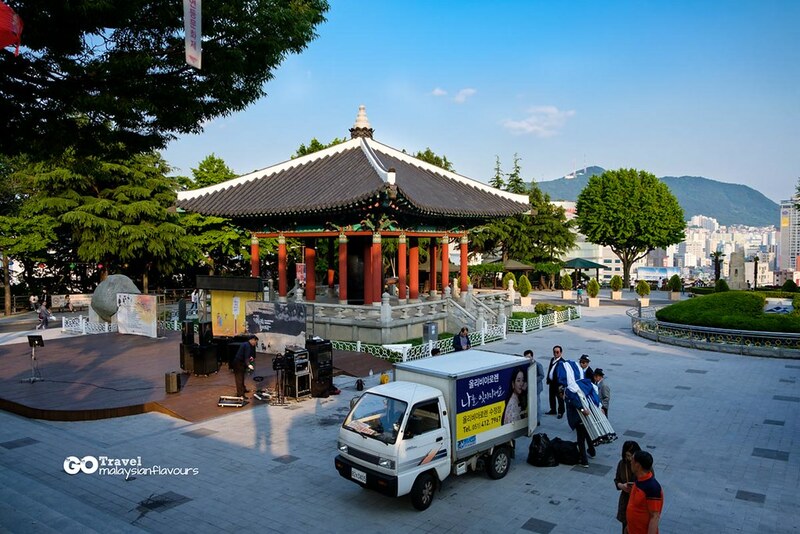 Along the way, we saw BIFF Plaza, the well-known place that was once the official venue of Busan International Film Festival, which is now re-located to Busan Cinema Center. 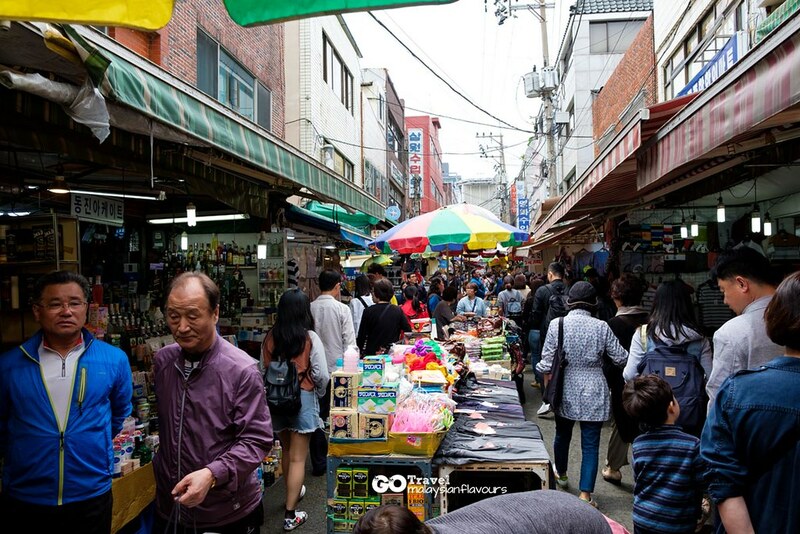 The street is about 428 meter long, brimming with food stalls, theatres and also hand-prints of celebrities like Shin Young-Kyun, Kim Su-Yong, Wayne Wang, Haou Hsiao-Hsien, Zhang Yimou, Tsui Hark, Isabelle Huppert, Yonfan and Hwang Jung-soon! Hand-print of Zhang Yi Mou – the talented film director and actor! 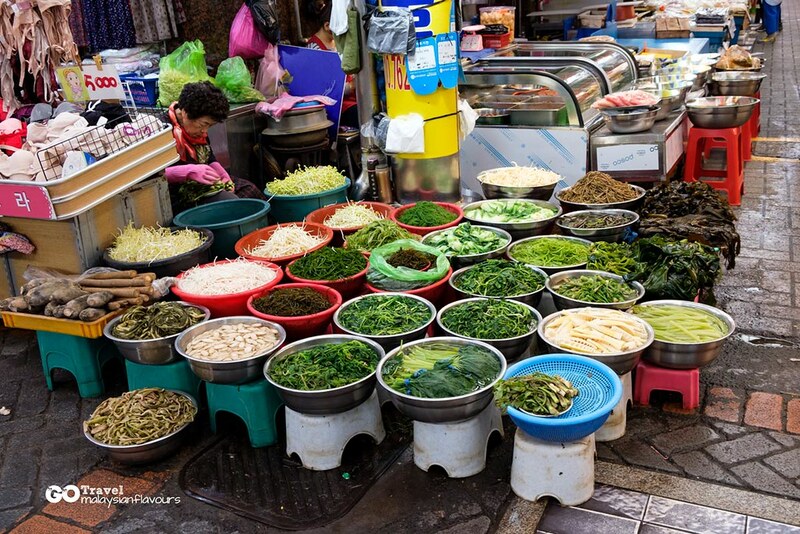 We are in rush and forgotten about the famous Ssiatt Hotteok, the must have street food near BIFF. 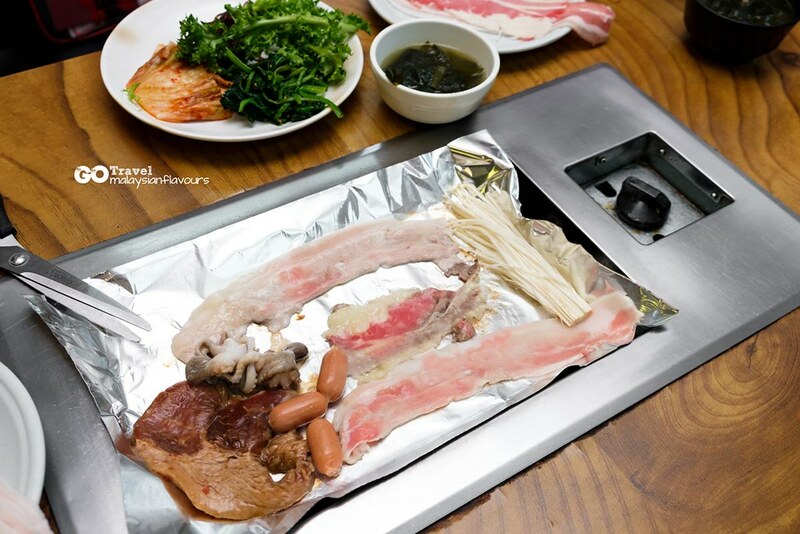 Even singer Lee Seung-gi came before too! It is warmth, sweet Korean pancake filled with sunflower seeds and sugar. Try it when you are here. 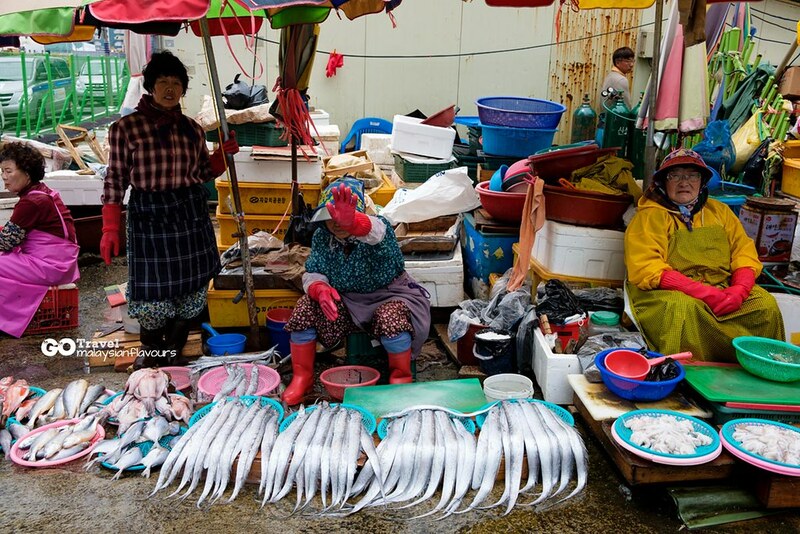 Next, to the largest fish market in Korea, which can be reached by aligning at Jagalchi Station too. 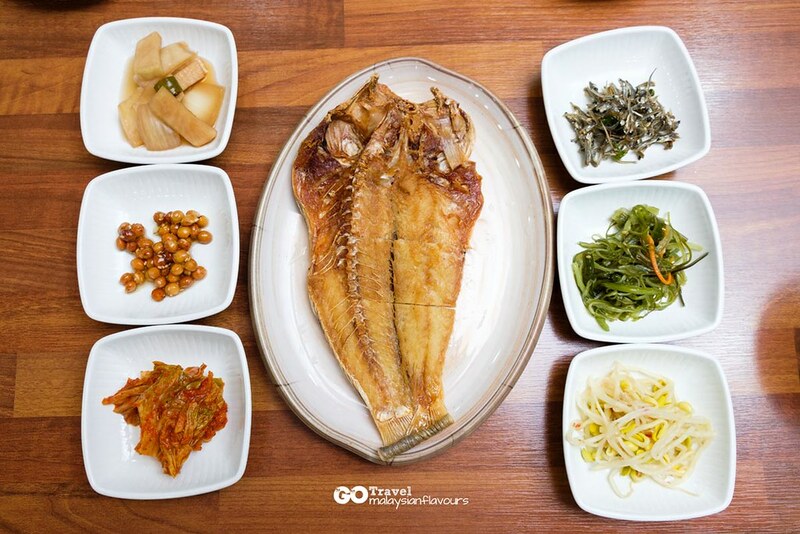 Famous for its slogan “Come, See and Buy”, Jagalchi Market 부산 자갈치시장 sells various kinds of seafood and dried fish. 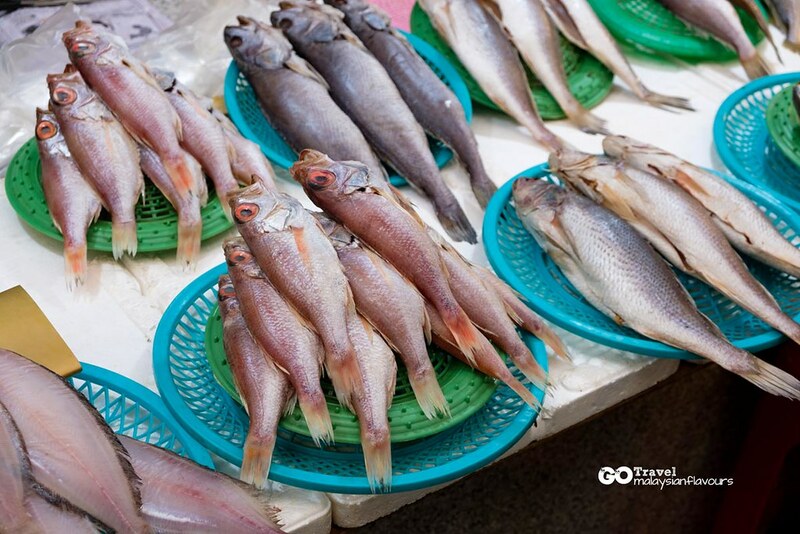 You can also purchase raw fish from the stalls and bring it to restaurants on second floor, and have the fish cooked for you on the spot – freshest ever. 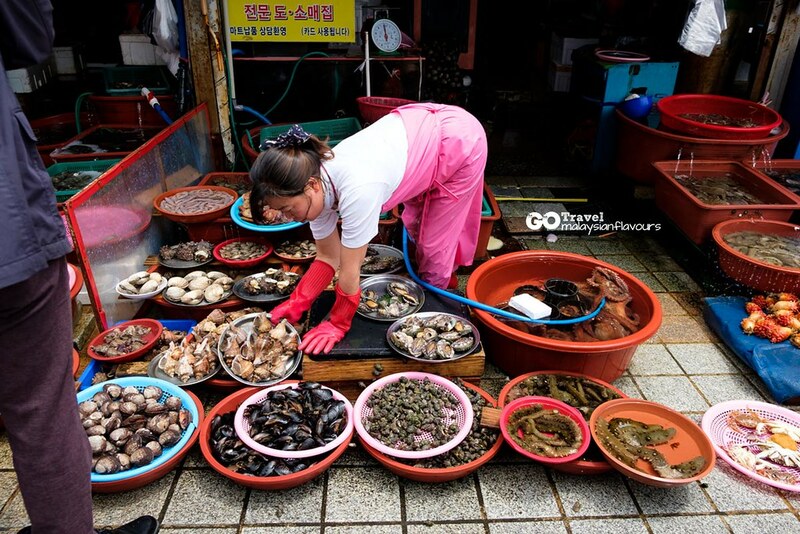 Busan Jagalchi Festival also held here very October too, featuring abundant fresh marine products, cultural events and performing arts. 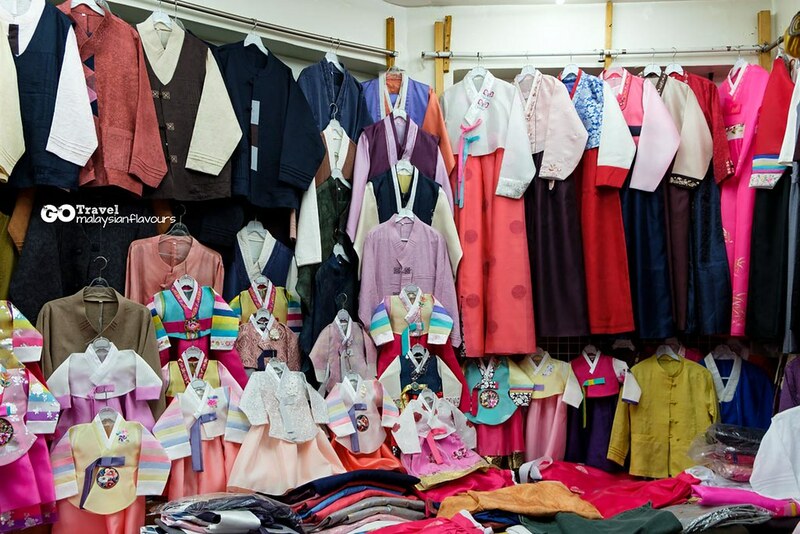 Address: (Nampo-dong 4-ga), area 52, Jagalchi-haeanno, Jung-gu, Busan, Korea. 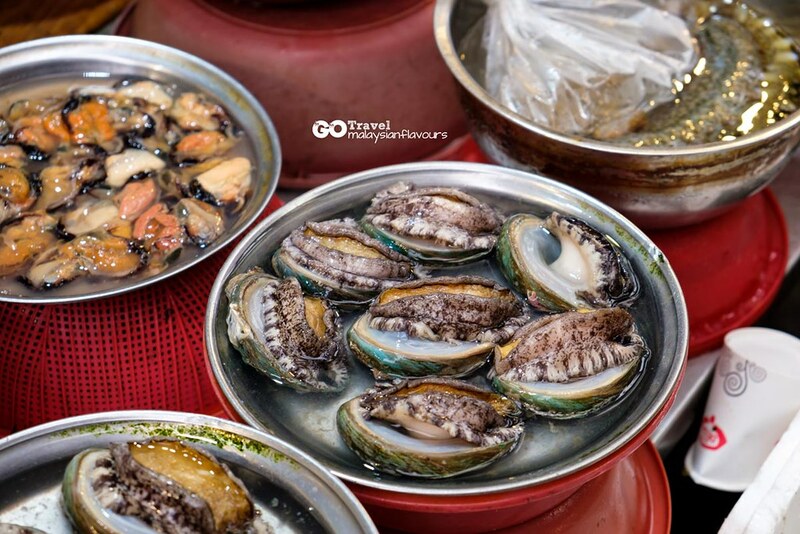 We didn’t buy any fresh seafood, but head to the 3rd of to have seafood BBQ buffet lunch in one of the restaurants inside Jagalchi market. 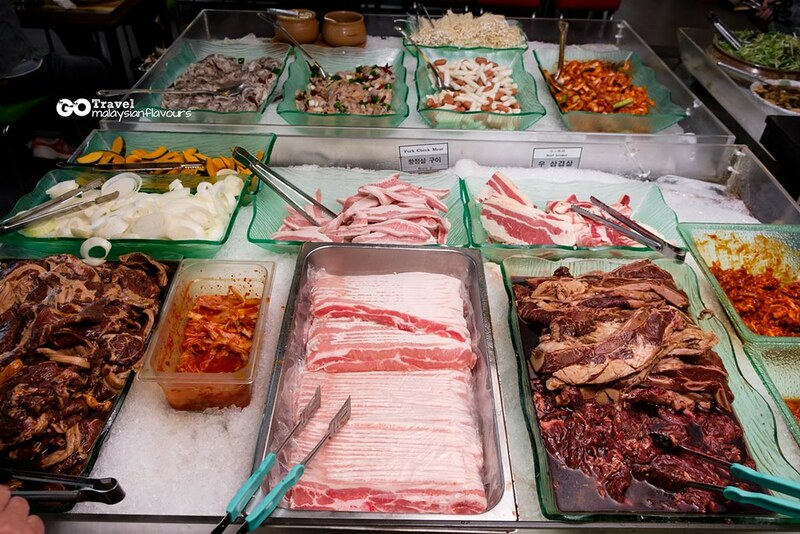 Happily helped ourselves to meat, seafood, pickles, vegetables and more. Found this behind Jagalchi Market! Took a stroll along the waterfront as we were too full from the satsfying buffet lunch. Very nice view! 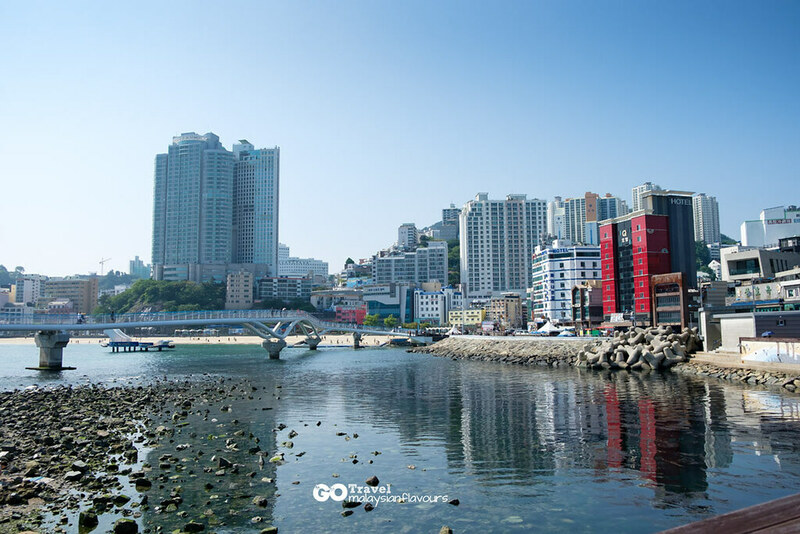 Head to a seaside stop next, the Songdo Beach. 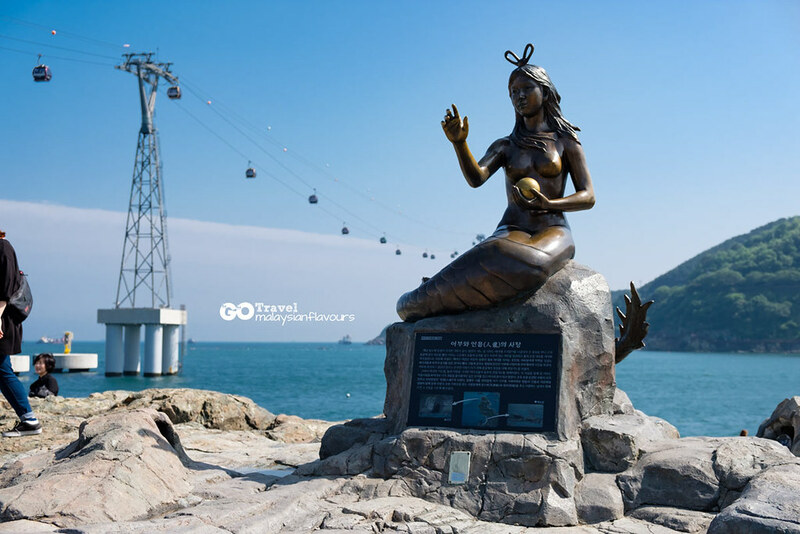 From Nampodong, we took a bus #7 to Songdo area and get transported from the liveliness of markets to a tranquil scene surrounded by sea breezes and calm waves. 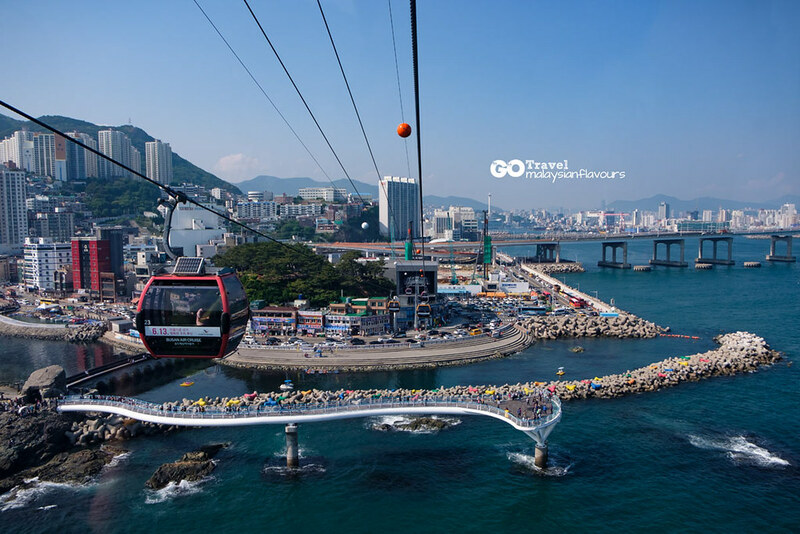 Songdo Beach, Turtle Island, Songdo Skywalk, Songdo Marine Cable Car Busan Air Cruise and Songdo Sky Park are all in this area. 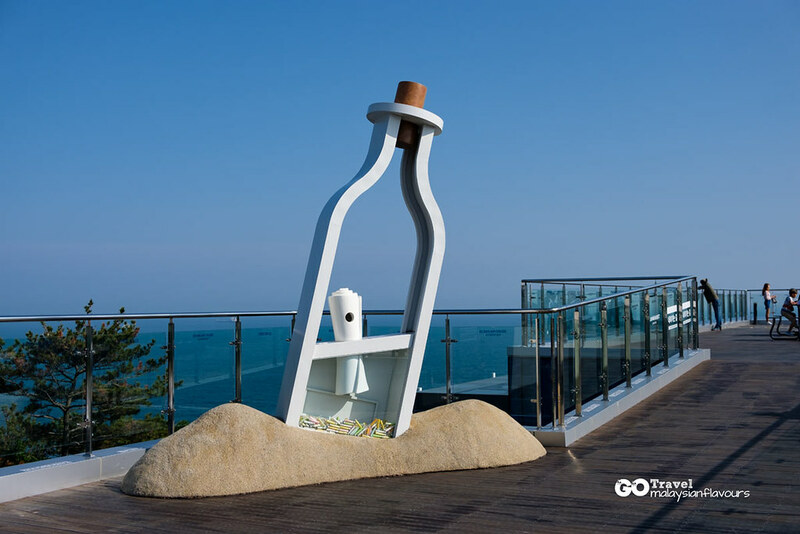 Songdo Beach 송도해수욕장 is the first official public beach in Korea, opened in 1913. 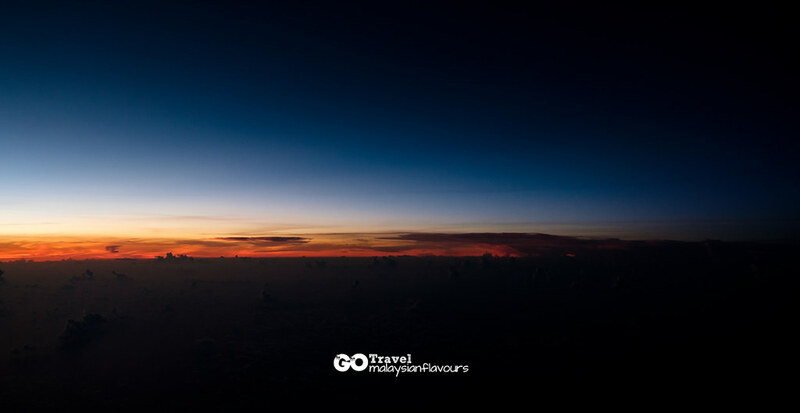 It is also a favourite escape for city dwellers during Summer time. 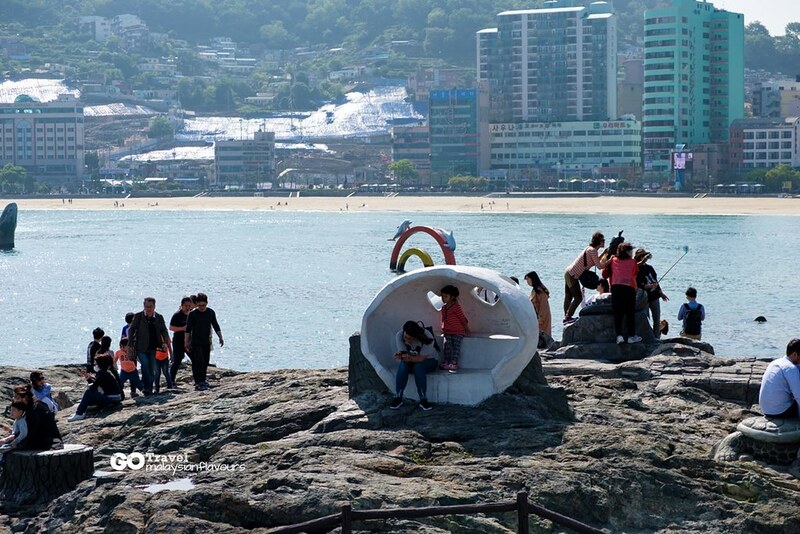 Due to issues like frequent hurricanes, loss of sand, coastal development and other factors, the beach was once facing decrement in tourists and unwanted damages but thankfully, it was now back to live through Songdo Coastal Maintenance Project! 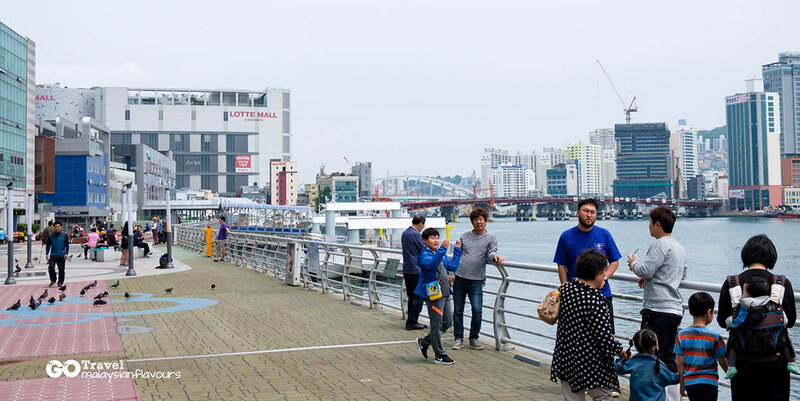 Since 2000, a comprehensive 5-year reconstructions has restored and expanded the coastlines, giving Songdo Beach a new look with various infrastructures, recreation park, sky bridge, cable car with transparent cabin and more to look forward to! 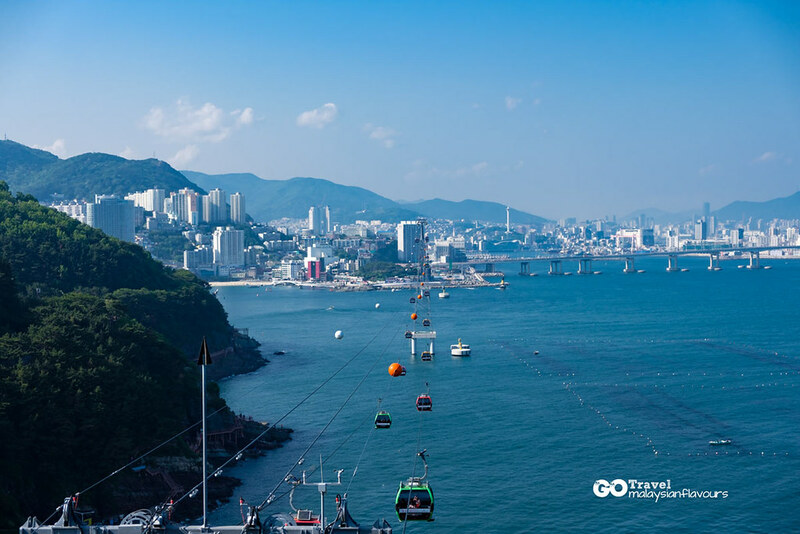 Songdo Cable Car, which is formerly named as Marine Cable Car, is finally back to operation in July 2017, after 29 years! 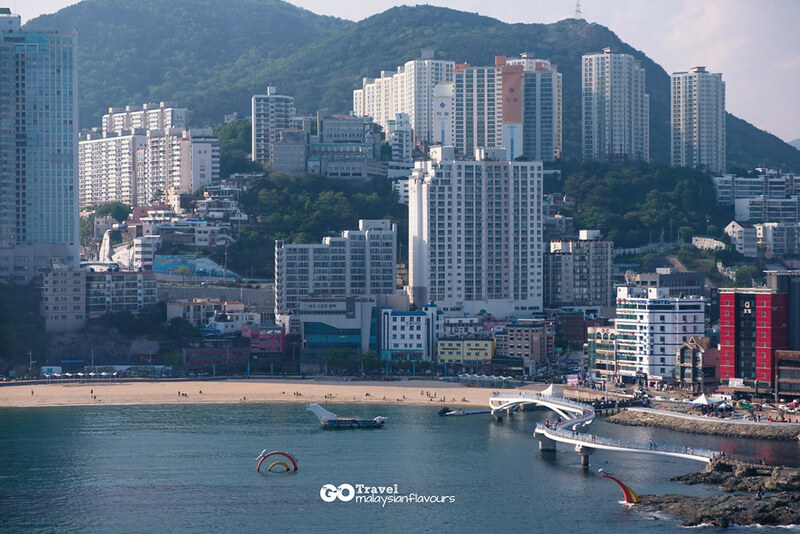 Busan Air Cruise is not only better, also the longest air cruise in Korea now. 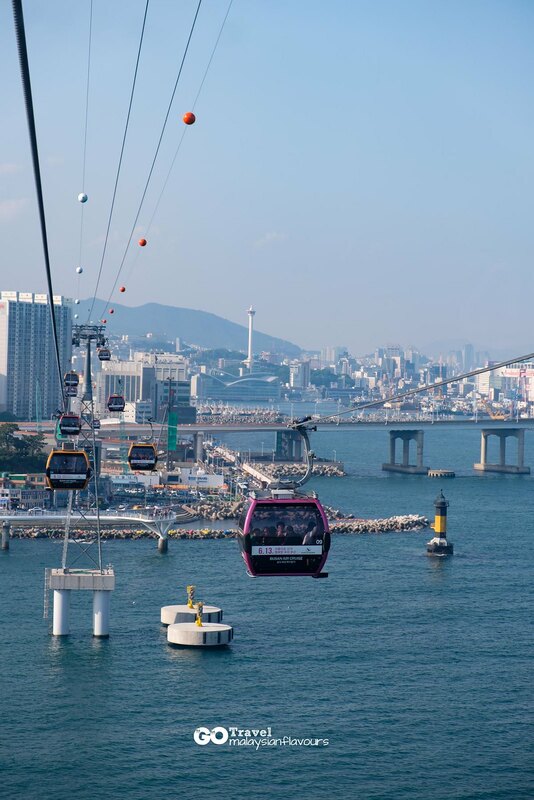 This cable car, which stretches over 1.62 kilometer connecting Songnim park to Amnam park, has swiftly becoming one of the hottest attractions in Korea. 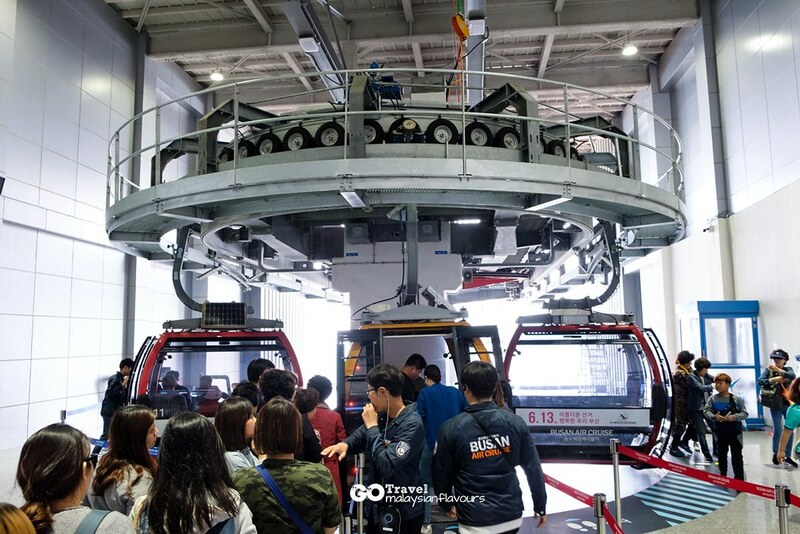 The cable cars are separated into Standard Cabin and Crystals Cabins with tempered glass floor. 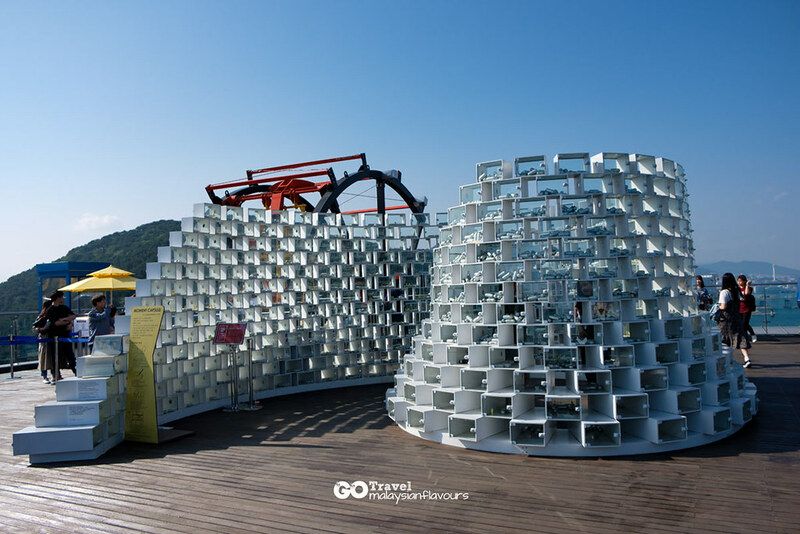 13 of them are Crystal Cabins – the most number of transparent cabins in Korea. 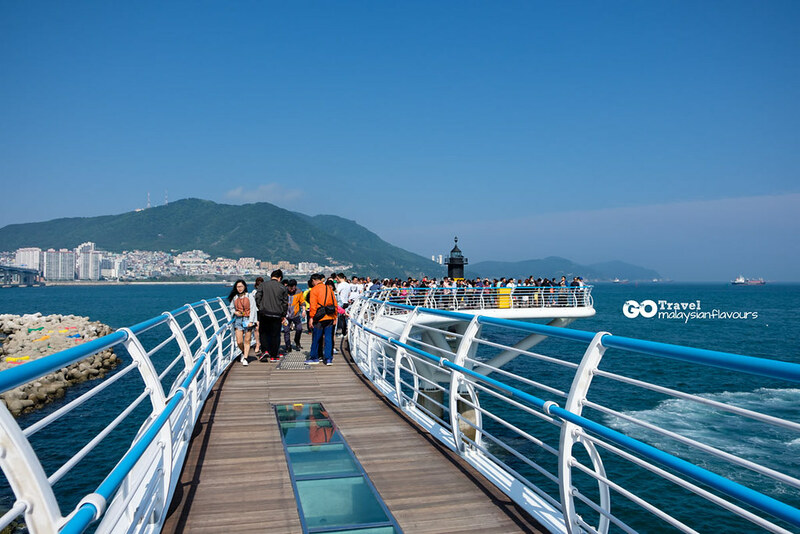 Ride on the Crystal Cabin if possible for an exhilarating experience of ” I am stepping on the sea” kind of feeling. 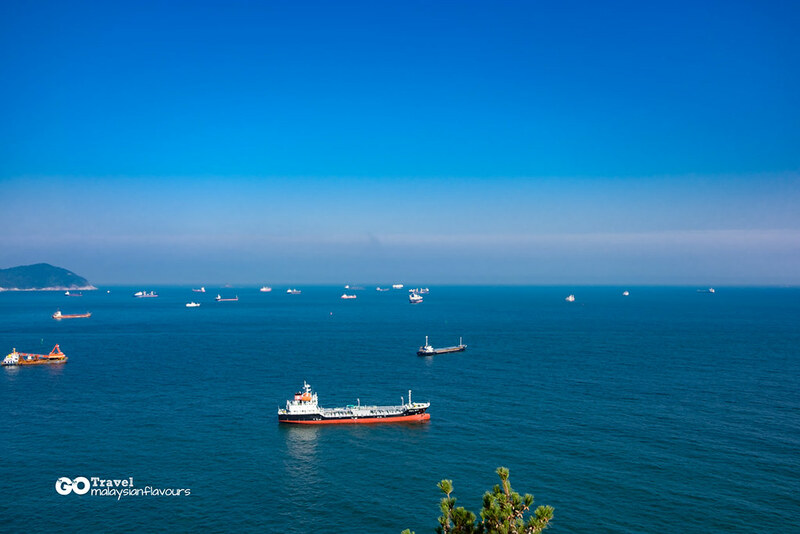 Stunning scenery of with Amnam National Geopark, Songdo Beach, South Port and Yeongdo came in sight as the air cruise went up slowly from Songdo Bay Station – Songdo Sky Park. 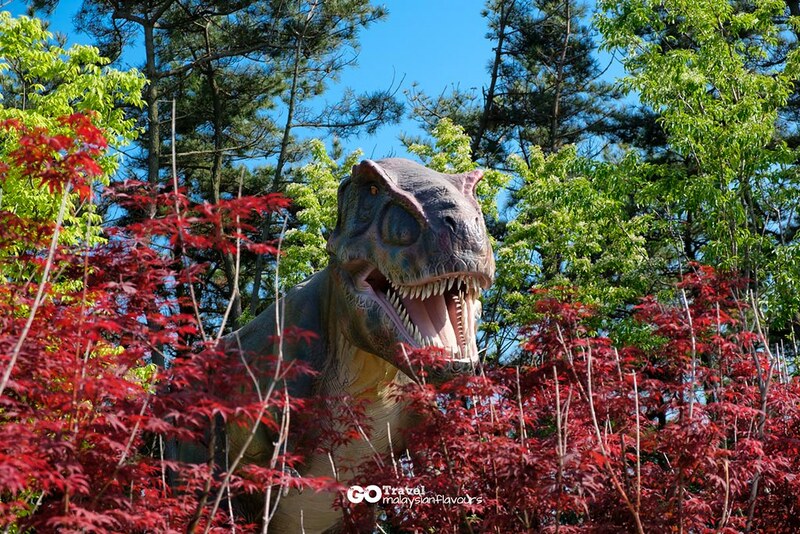 It can go as high as up to 86metres from ground! 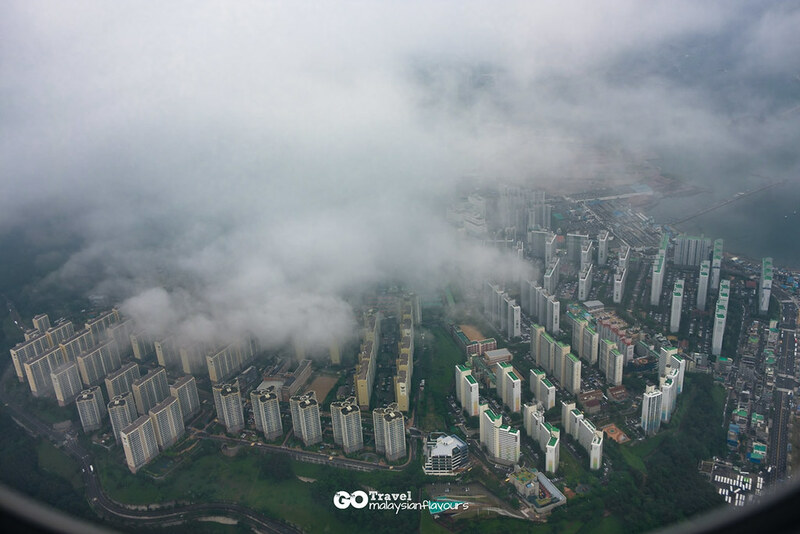 Reached the other end – Songdo Sky Park after about 15 minutes. 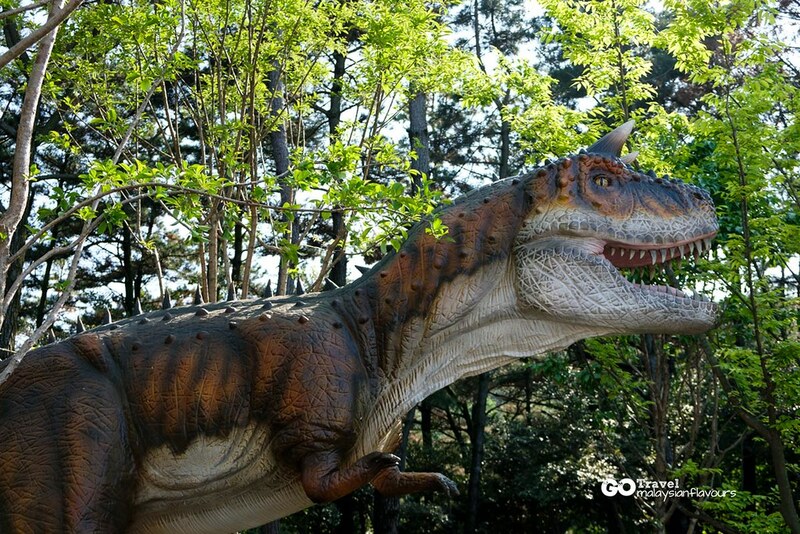 Surprised to see huge dinasours replicas in different sizes! Like walking in Jurassic Park forest. Hahaha. 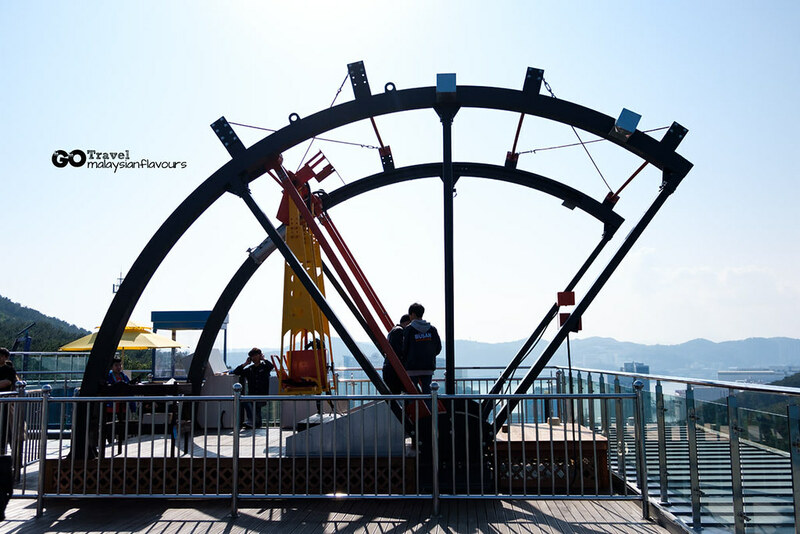 Followed the guided brochure and discovered few things to do here, like enjoying stunning view at Sky Harbour Observation Deck, Take Pictures with Moment Capsule and wrote down wishes on Bucket Dragon of Wishes. 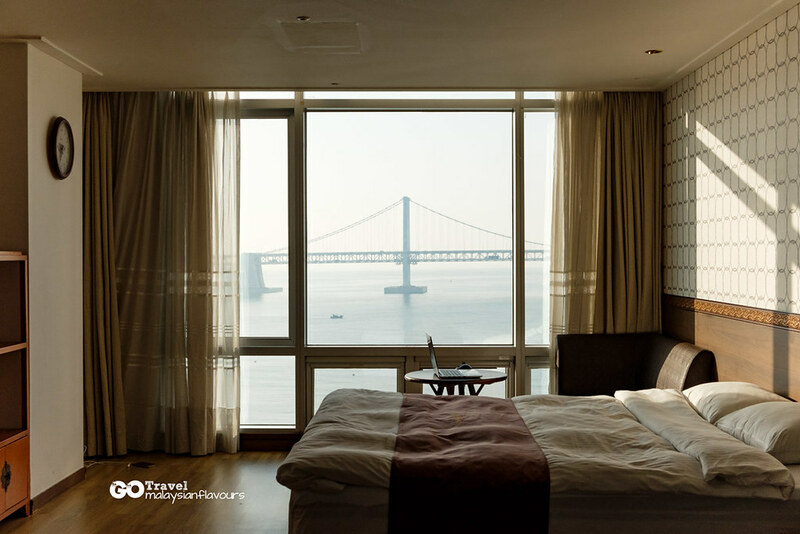 Seal your unforgettable moments here. 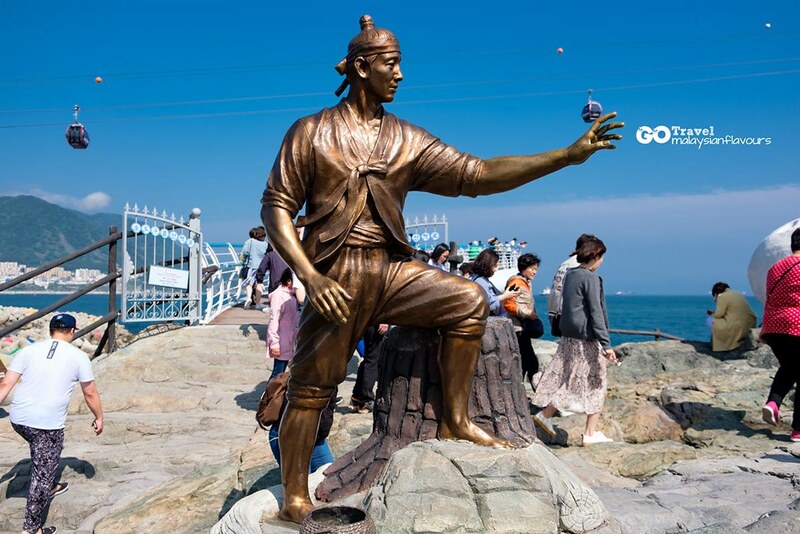 Take pictures with fisherman, quotations, and dragons that appear in the Songdo legend. 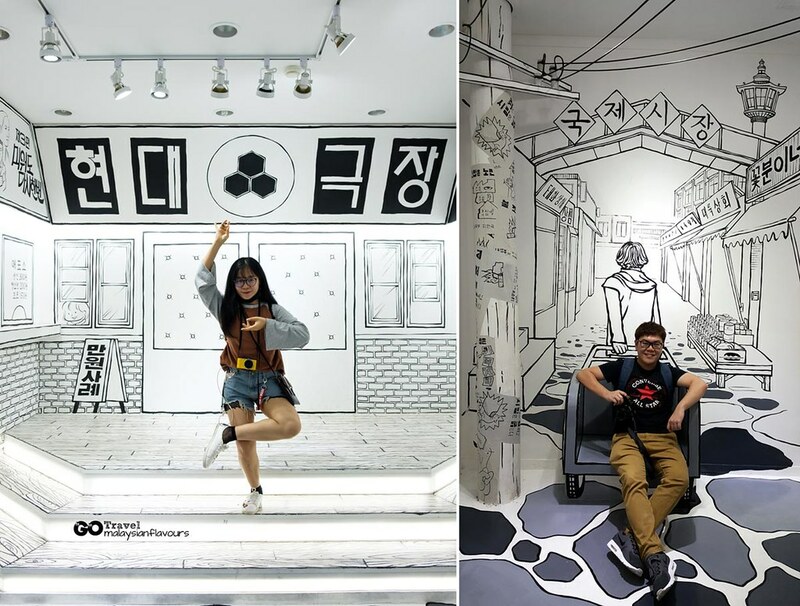 a floor filled with various themed contents, observation deck for the most beautiful seas of Songdo and Time Garden. 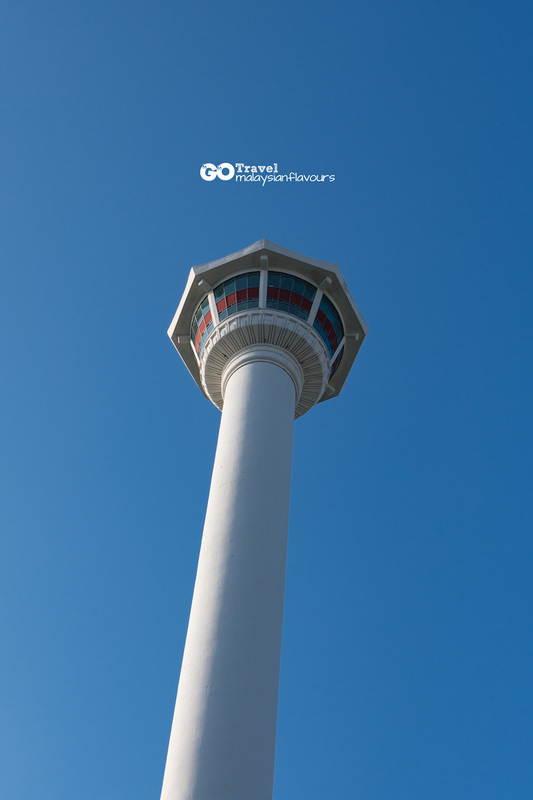 Feel the Air Cruise up close! 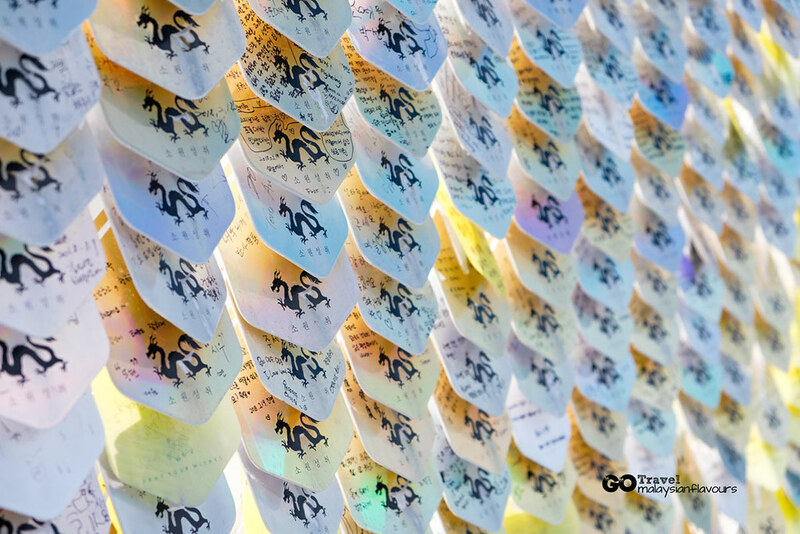 write your wishes on the scales of an ascending dragon and hope for wishes come true! 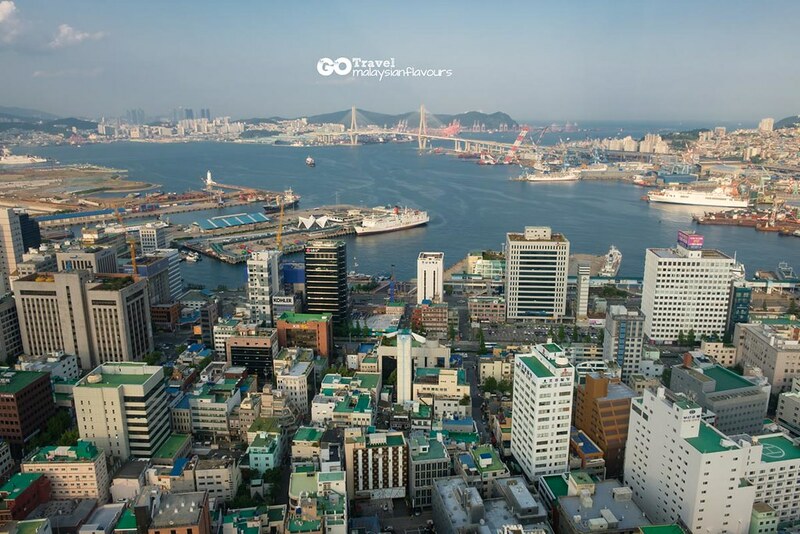 Went back to Songdo Bay Station (Ground Station), and walked down Songdo Skywalk 송도해수욕장. 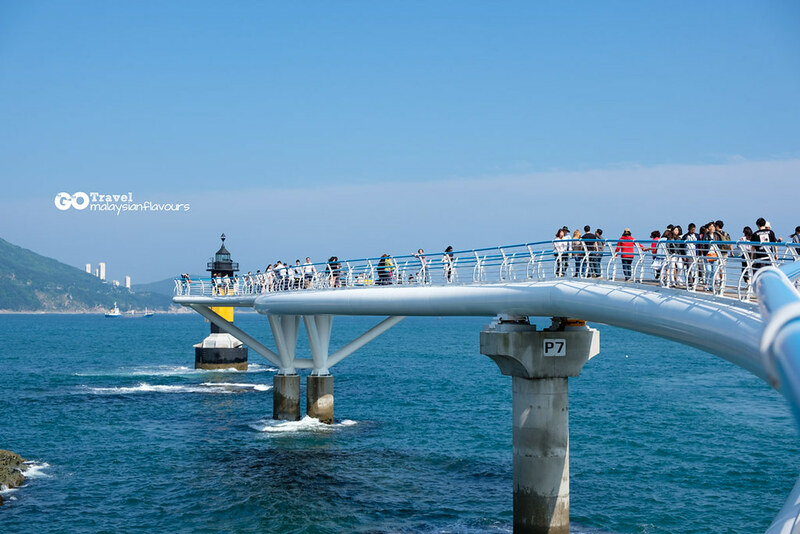 360-meter long bridge built towards the sea, well-known for its curvy shape like a dragon. 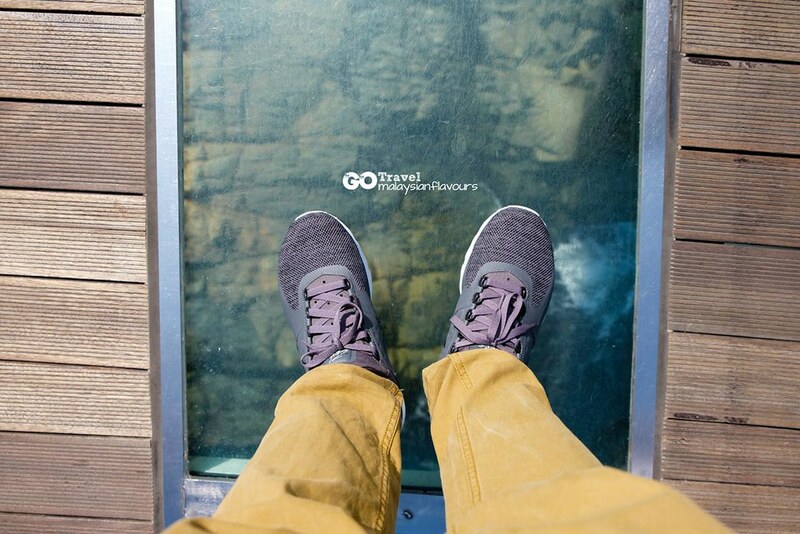 Transparent glasses are installed at certain parts of the walkway for a view of the ocean below. Cool right? 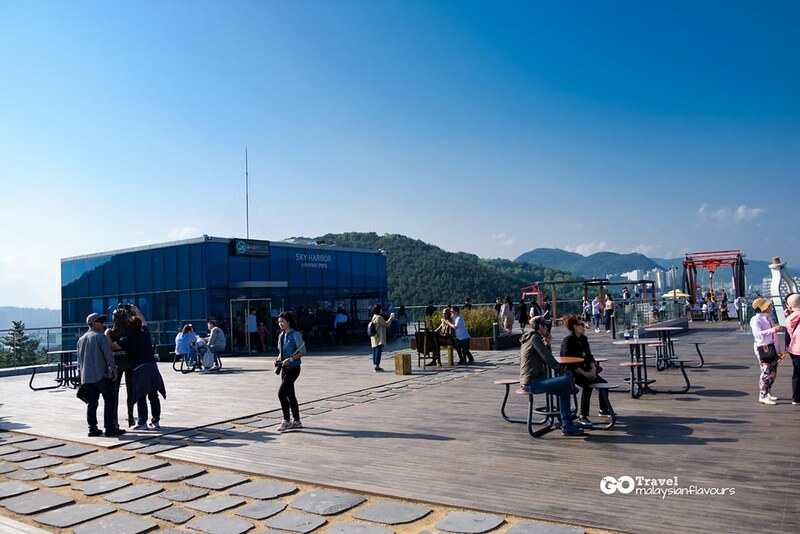 The Songdo Sky Walk linked us to Geobokseom (Turtle Island), a small rock island. The island is small, but still, loud applause for building few rest areas for visitors, as well as some spots where you can take photo with. Spot the seat in the shape of turtle in picture below. Hehe. Subway: Busan Metro Line 1 at Jagalchi Station, Exit 2. Take bus 7, 9, 26, 30, 71. Get off at Songdo Beach, walk for 10 minutes. 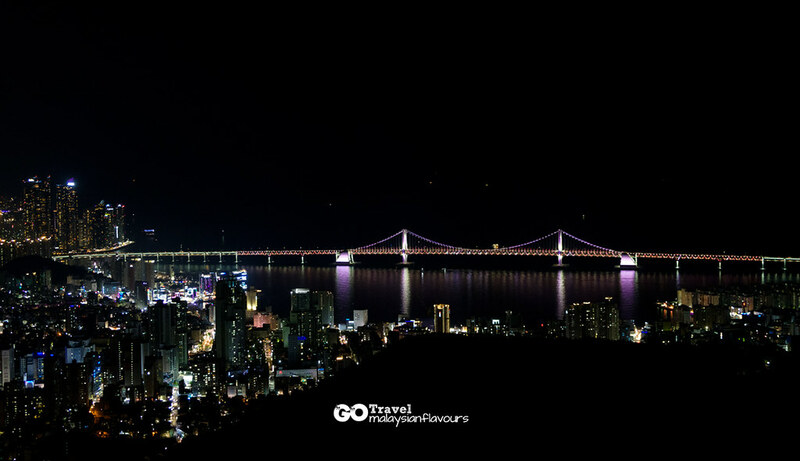 Busan Tower, the iconic landmark in Busan city, just like Seoul has Seoul Tower. 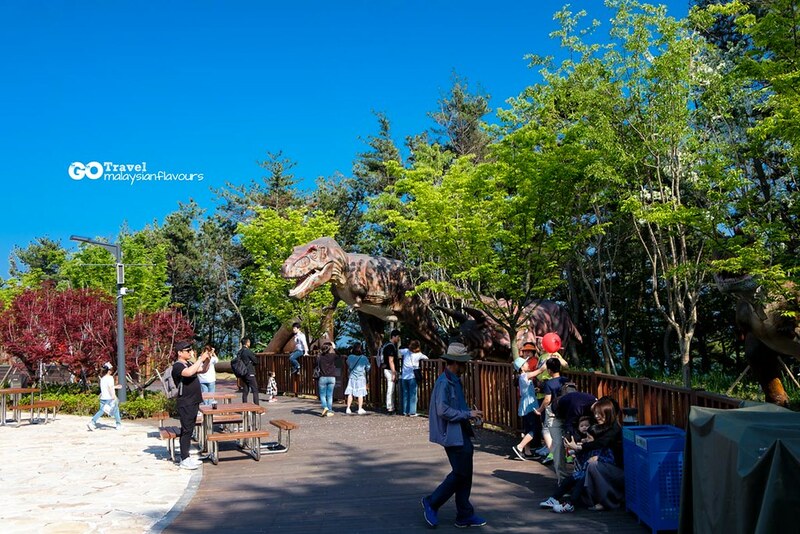 120-meters height, stands 69-meters above sea level at Yongusan Park in Jung-gu. 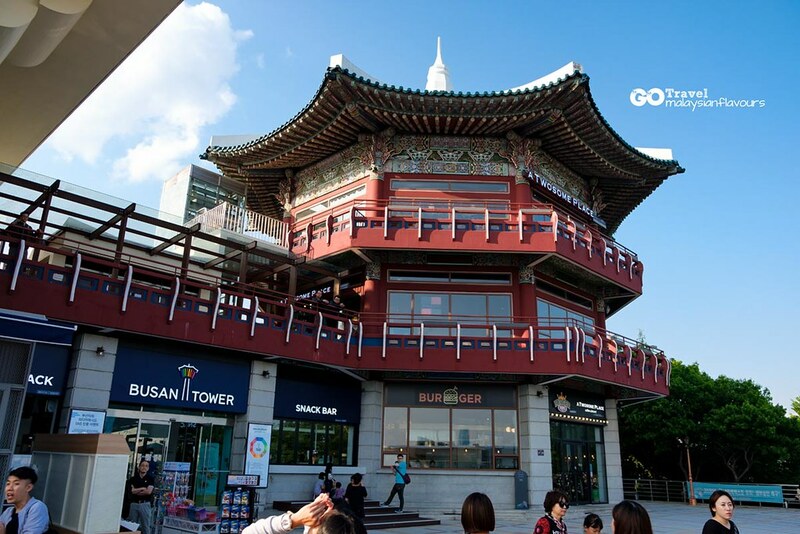 The top of the tower is modelled after the baldaquin of Dabotap Pagoda in Bulguksa Temple, Gyeongju. 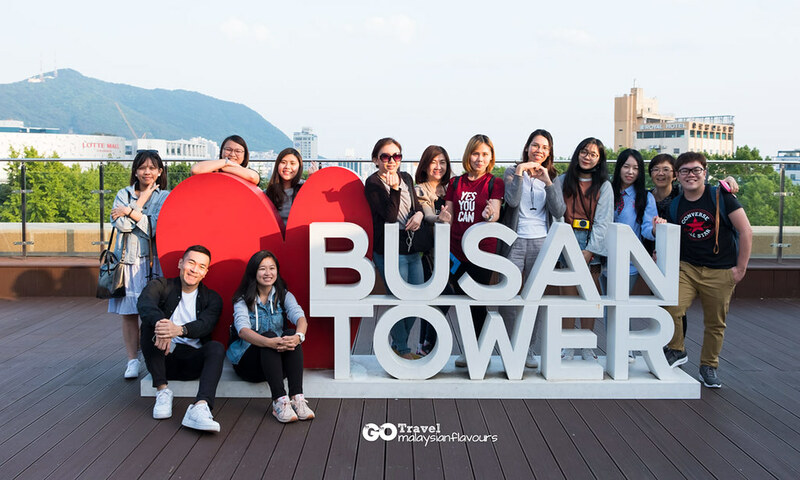 If you observe in detail on the design, you will find that the 8 colours shown on the Busan Tower logo actually features 16 major attractions centered around Busan Tower as motifs. Each colours is displayed on the 8 sides of the observatory, so check them out when you are in the tower viewing from high up! 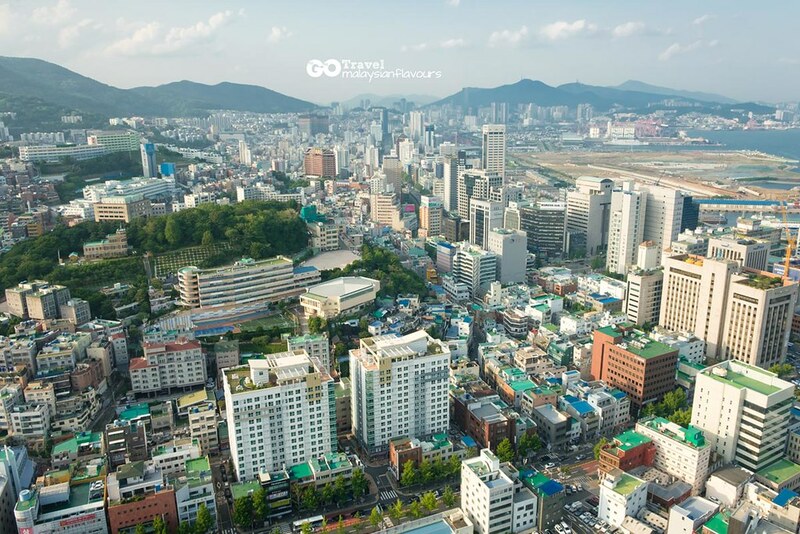 Fantastic city view aside, we learnt about the past and present of Busan through a media gallery at Tag Live Wall. Had fun in Black Wonderland and 6-themed exhibition too! 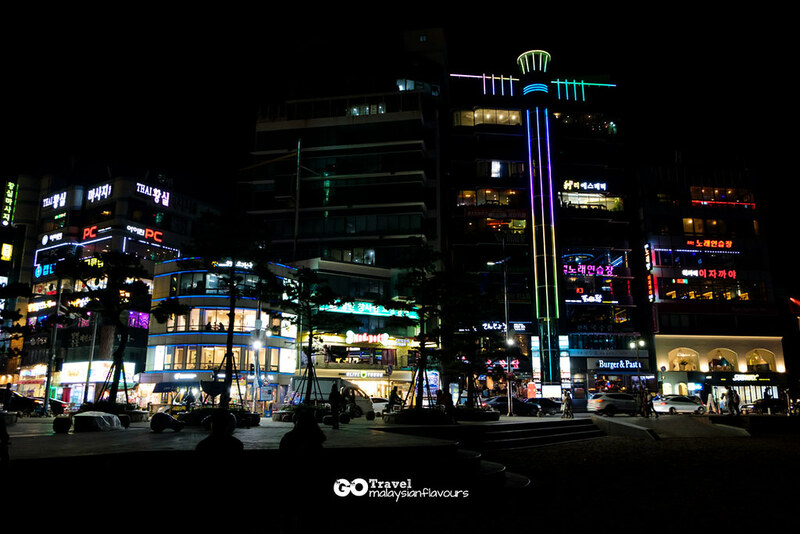 Light show, media facade, optical art display allowed us to know more about Busan, while giving lots of photography opportunities. 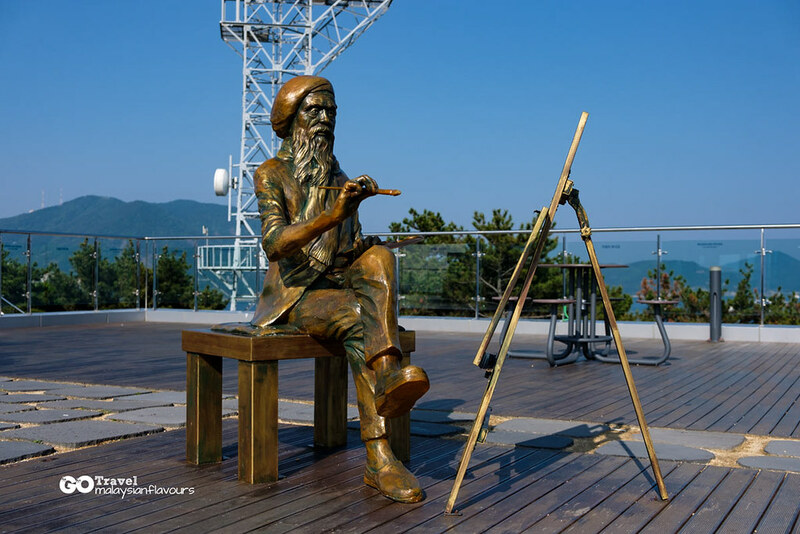 The surrounding of Busan Tower is Yongdusan Park. 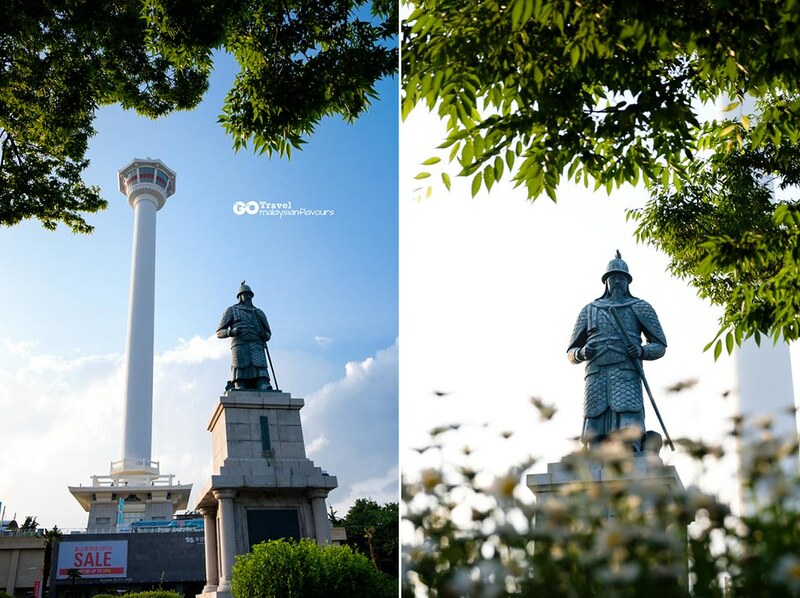 It is also home to home to a Cheokhwabi Monument, Chunghontap Pagoda, 4.19 Revolution Monument, Admiral Yi Sun-shin statue. A group picture with the lovely gang before leaving! 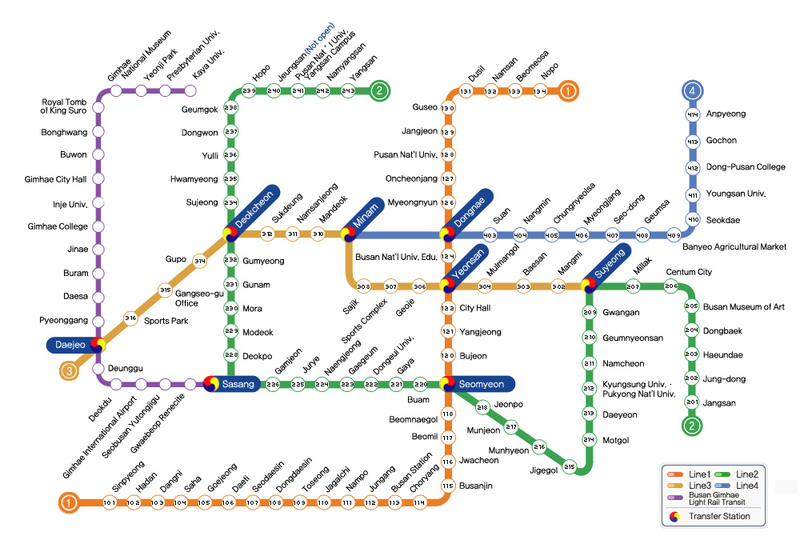 Subway: Busan Metro Line 1 at Nampo Station, Exit 1. 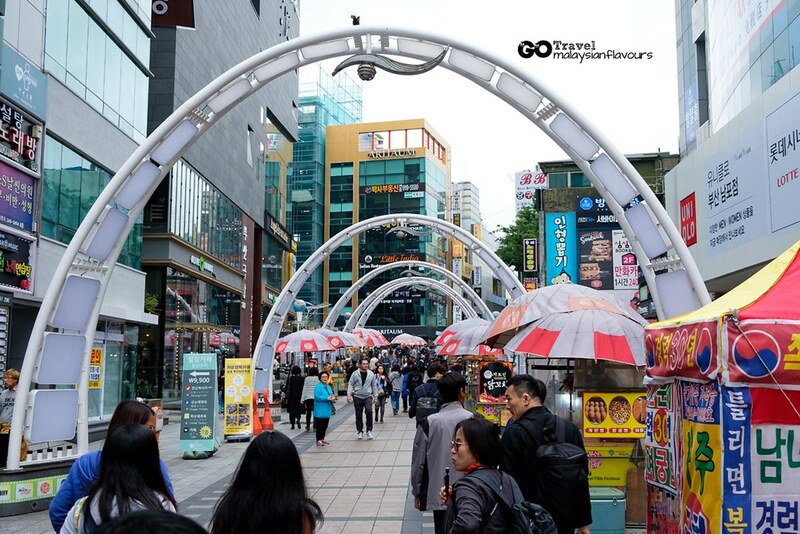 Walk through Gwangbok-dong Fashion Street until you see an escalator leading to Yongdusan Park. Go all the way up until the end. 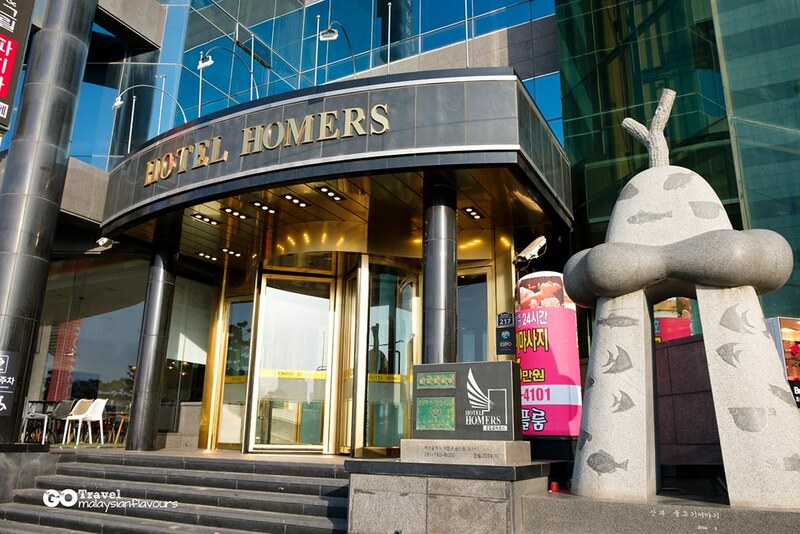 Checked in to Homers Hotel Busan, located next to Gwangalli Beach in Suyeoung-gu area. 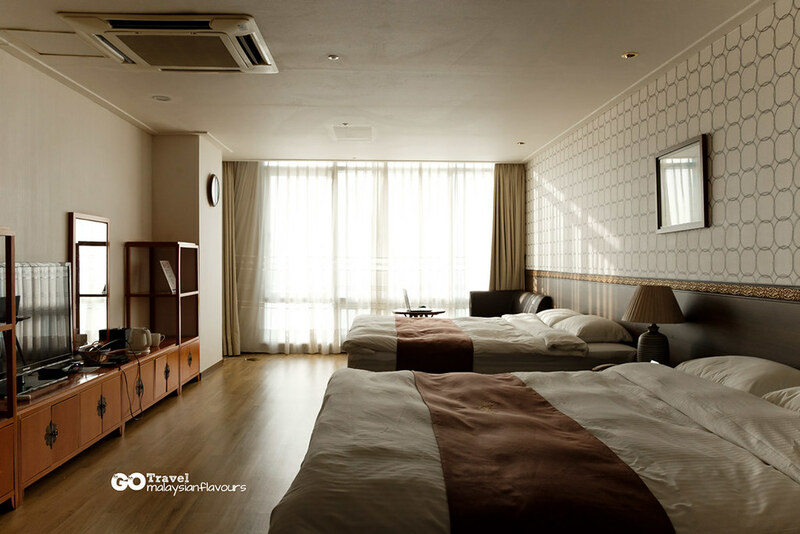 Very convenient hotels with plenty of restaurants, cafes and convenient stores nearby. 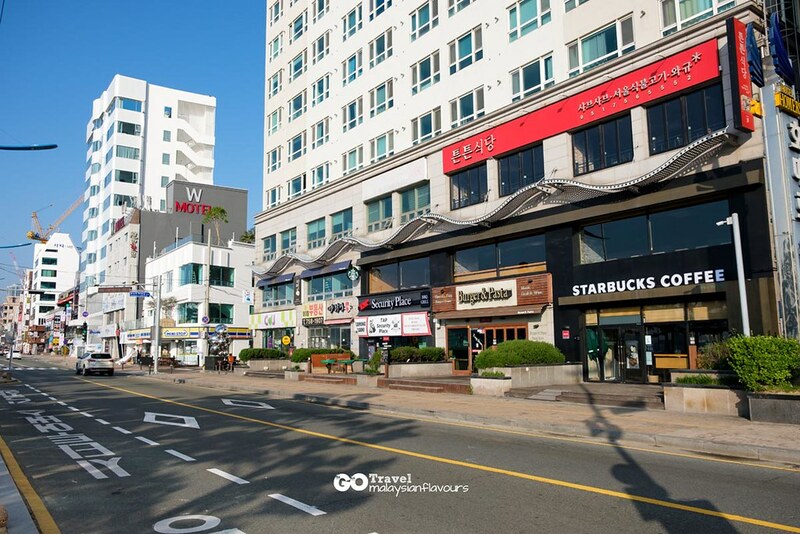 Near to subway Gwangan Station too, about 10 minutes walk. 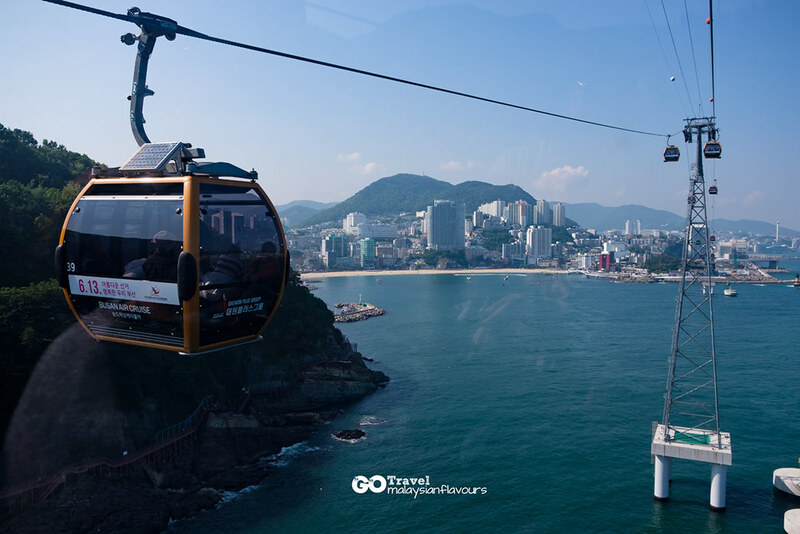 Hence it is easy for travellers to hop around different attractions in Busan by taking the Metro. 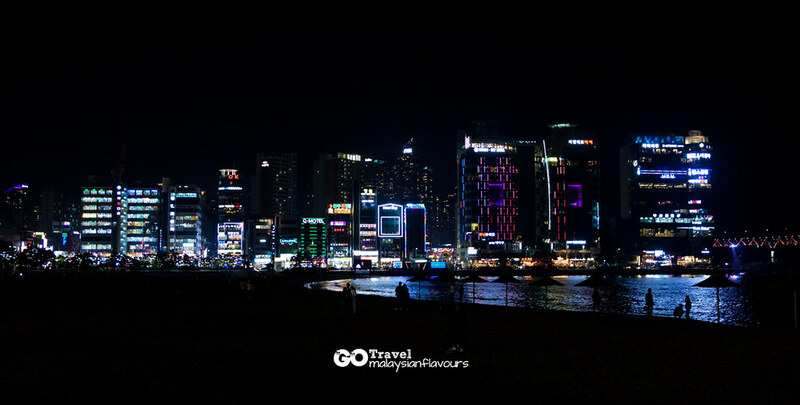 This hotel has rooms facing the seaside, making it a popular choice during special festive season such as Busan Fireworks Festival in October, as it serves as a great location to see fireworks and colourful laser shows with theme music. View from our room. 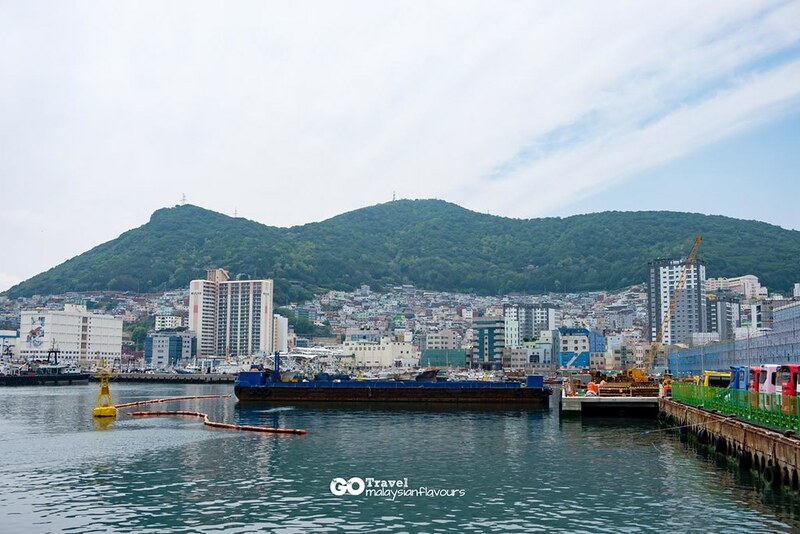 Can see the Gwangandaegyo Bridge stretching across the ocean! 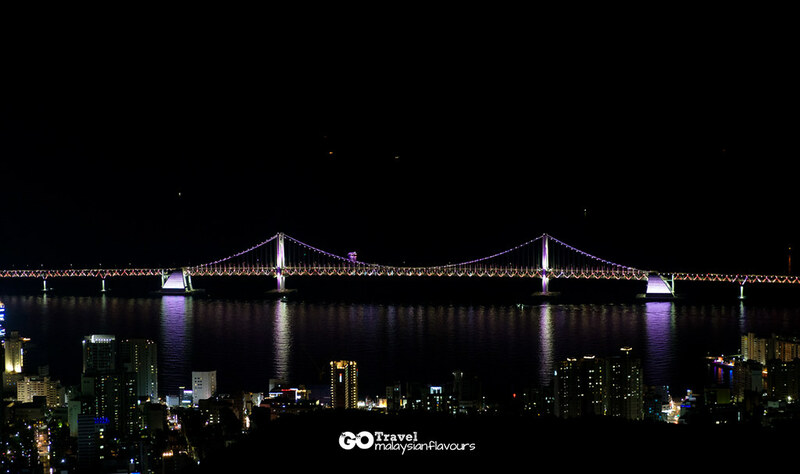 Gwangan Bridge is especially beautiful at night when fully light up, as it is equipped with the world’s largest LED lighting and sound facilities for bridges. Therefore, some people called it as Diamond Bridge. 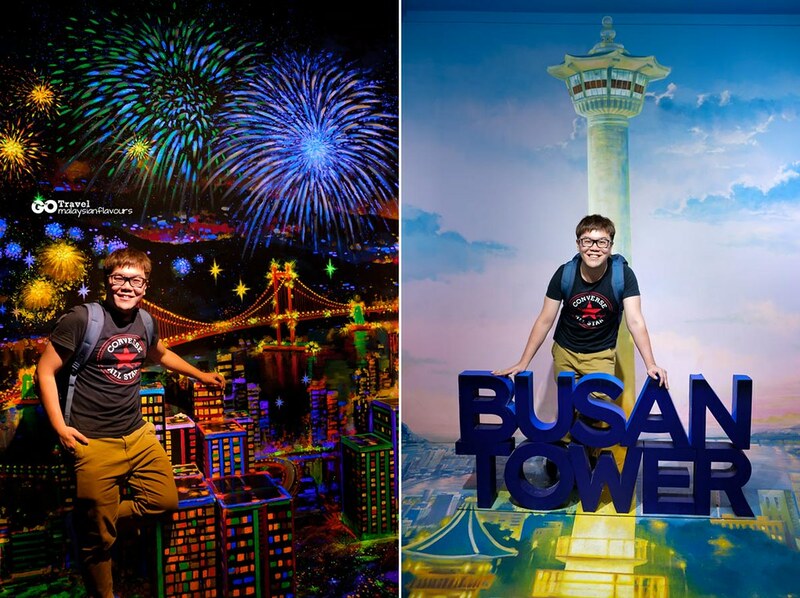 Catch the laser show 3 times a day at 8.30PM, 9.30PM and 10.30PM. 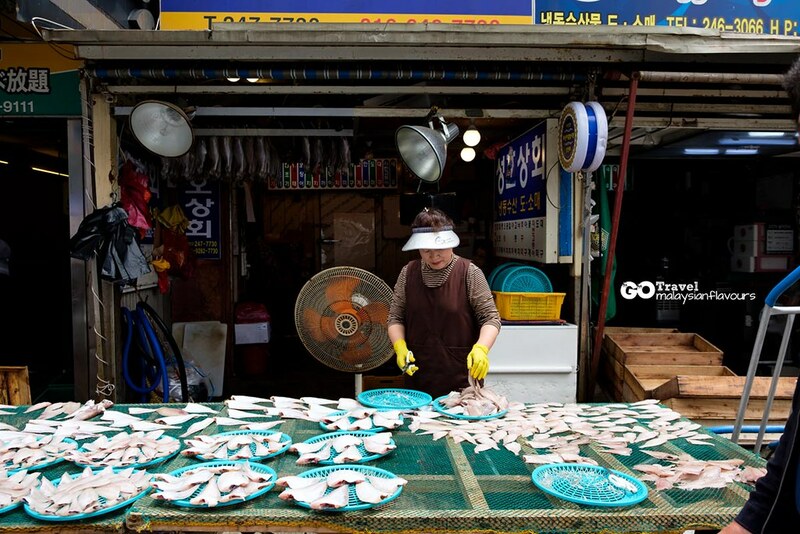 It lasts for about 10 minutes over the night sea of Gwangalli. 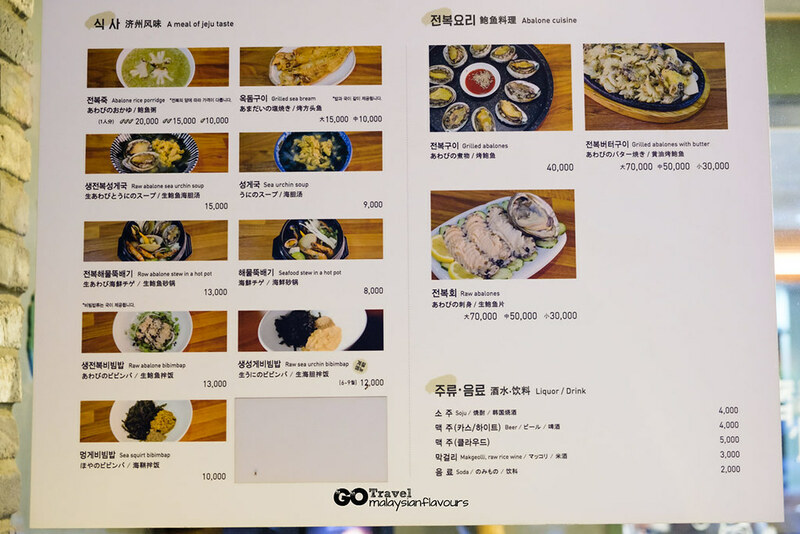 Dinner was a bit premium, with abalone as the main dish. Hehe. 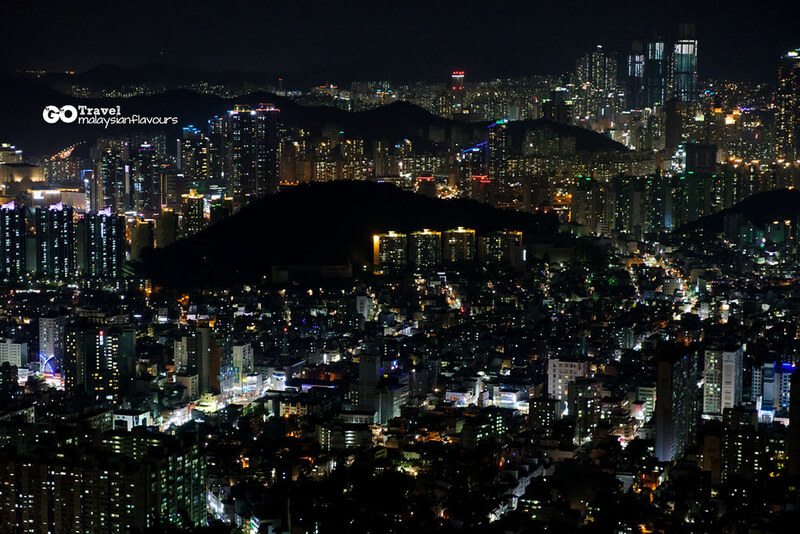 Went up to Hwangnyeongsan Mountain for Busan Night Tour after dinner, admiring the magnificient view of this town. 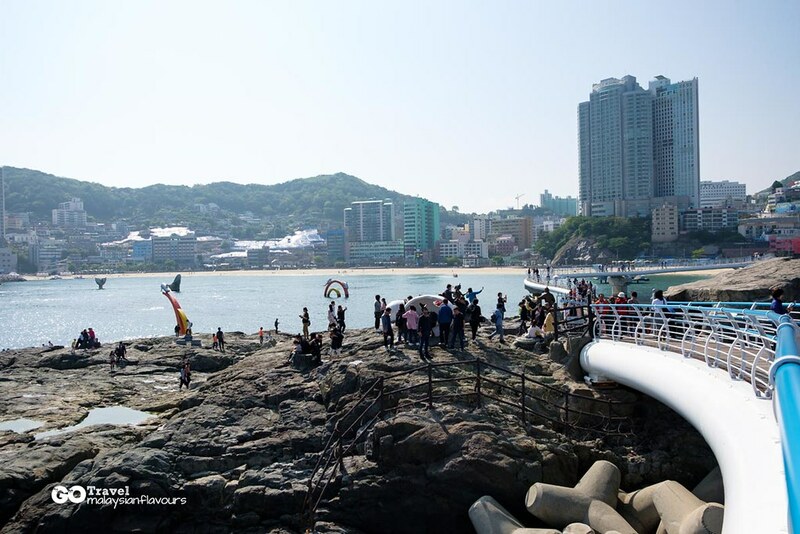 NEXT: Day 2 in Busan – Seaside Temple, Coastal Park, Sky Bridge with Transparent Floor and more! Omg! I was there in past May too, but I wished I had your itinerary instead! Haha, ya, a lot indeed. Will make it a more slow n’ steady leisure version next time haha. Can I have ur Busan itinerary please?